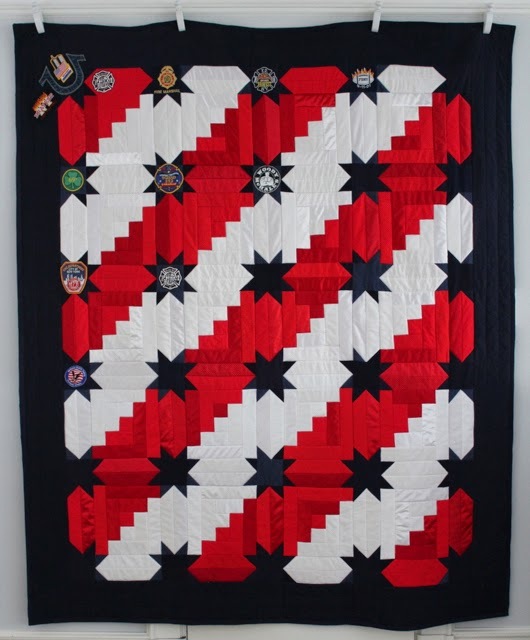 I have been working on a memorial quilt for the daughter of a Colonel who lost his life while serving in Iraq. 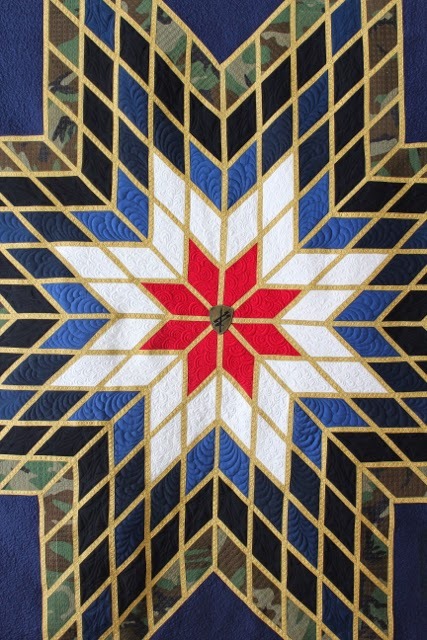 The quilt pattern is a Lone Star – which I think can be a very majestic pattern. There are feather swags between the points of the stars. 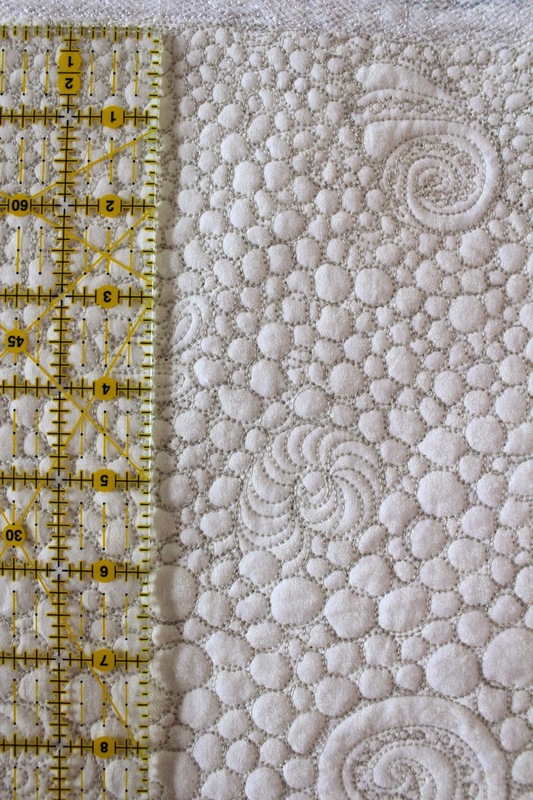 Each star point is made from the gold ribbed ribbon that went down the side of the dress pants. 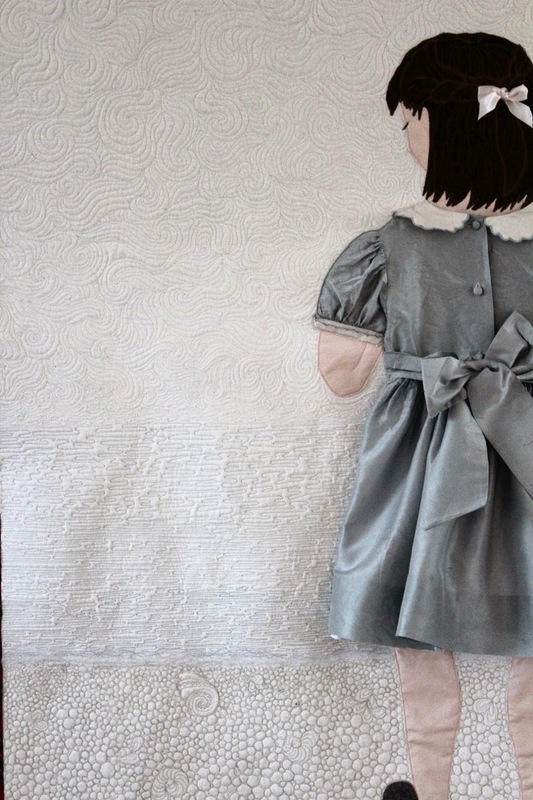 If there were any fabric remains the family had asked for a pillow or a doll. We had enough fabric for both. 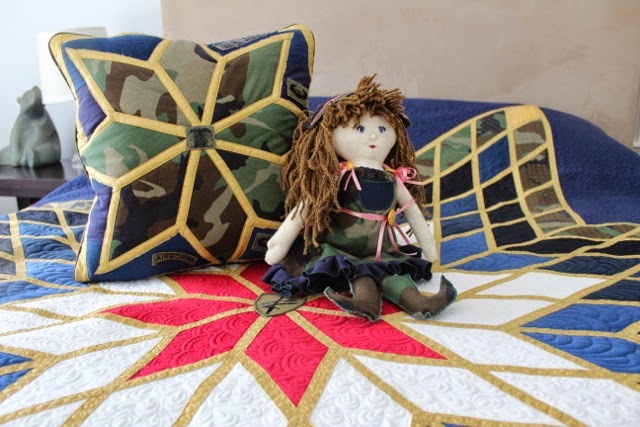 The pillow has many of the patches that I took off the camouflage jacket. 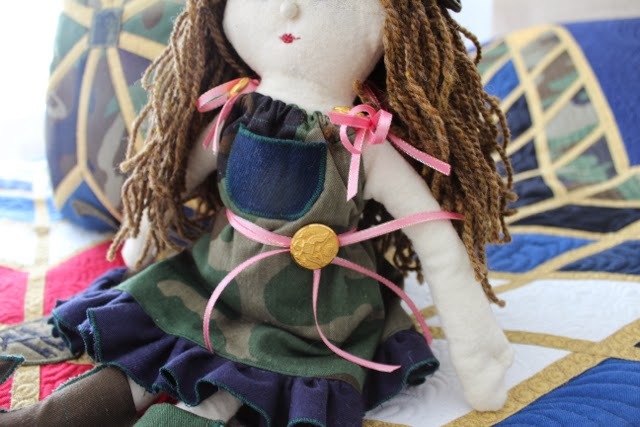 The doll is made from some of the camouflage jacket and shirt material. Her hat is made from a cuff from the camouflage jacket and I added some gold buttons from the black dress jacket. My girls were cuckoo over this doll and kept coming to ask where the doll was, to stare at her AND asking when they would get a doll too. 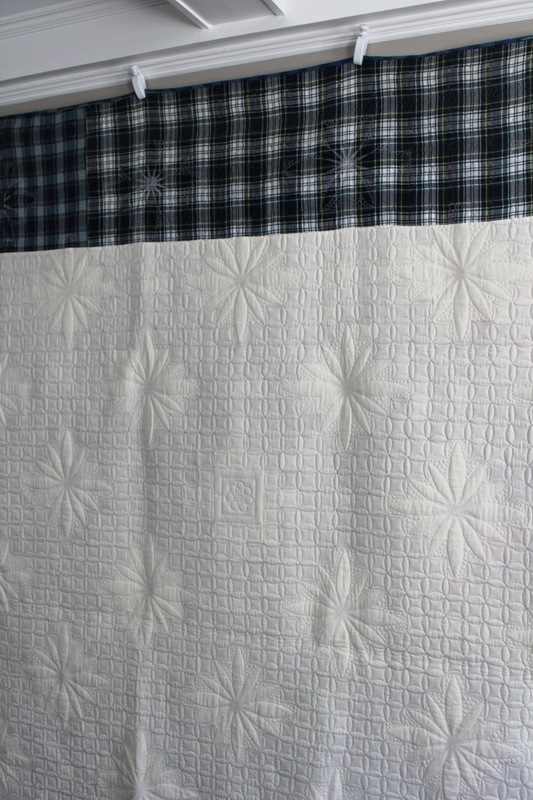 The backing is flannel and the batting is wool. 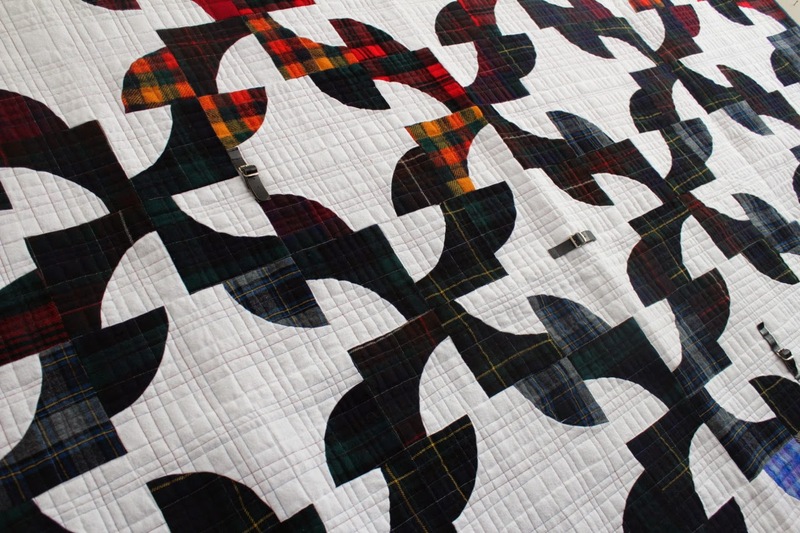 Even with the dense quilting the quilt was not stiff. 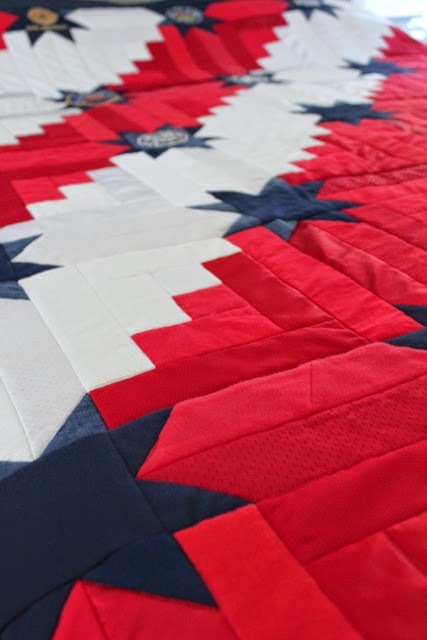 Here is a shot of the back of the quilt for those of us who are obsessed with seeing the back of a quilt too! 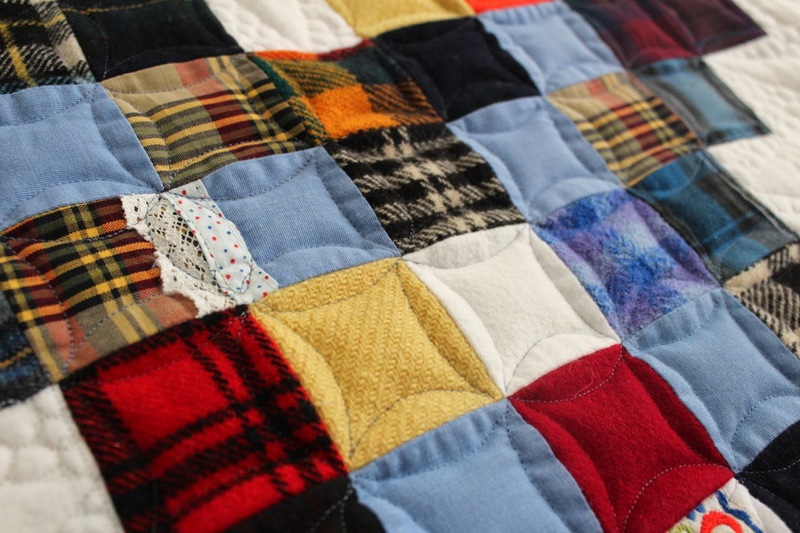 Once the quilt was folded up ready to go home it looked so regal – I felt quite overwhelmed. I do hope that the family love it. Just to recap these toddler dresses were given to me to make a pillow. 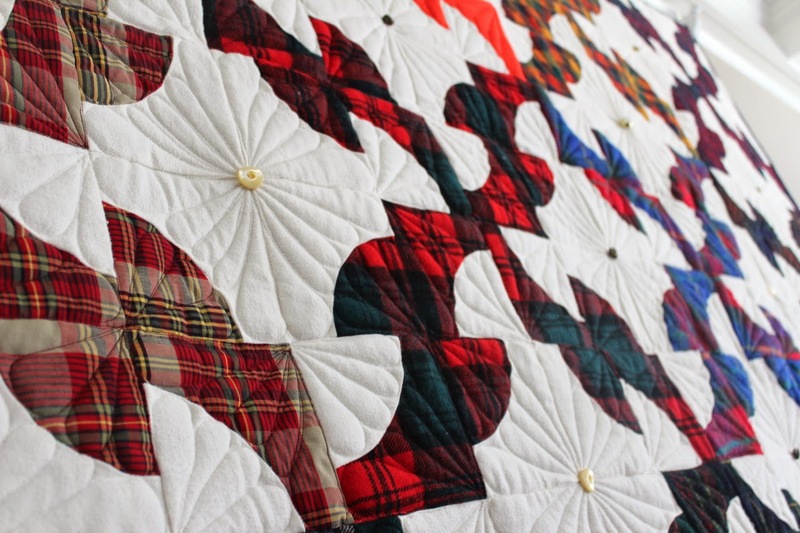 I couldn’t bear to just cut chunks out of the dresses without using up all the material given to me – so I suggested a quilt as well. 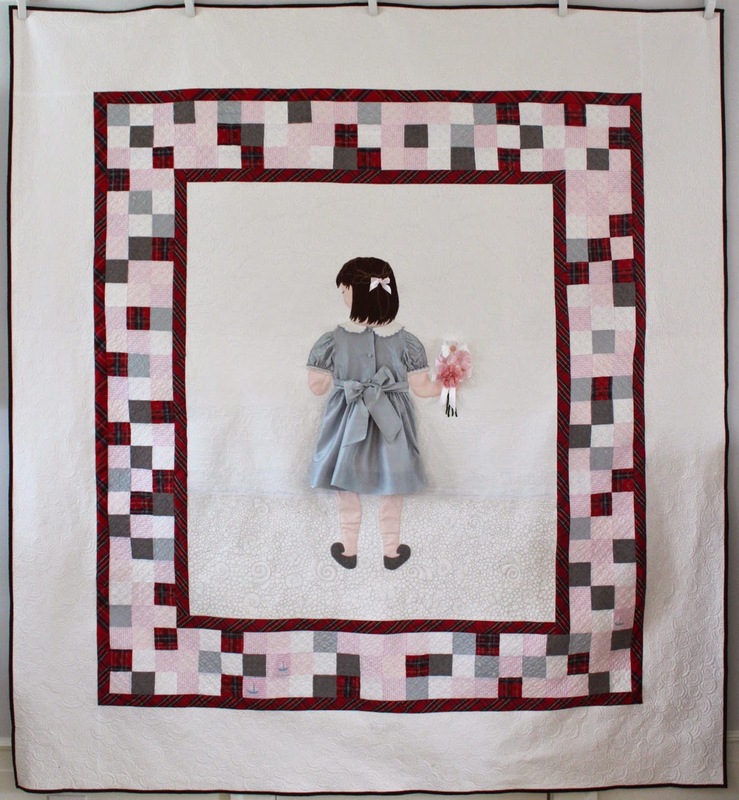 I have had this idea of having an actual dress sewn to the middle of a quilt – as if in a picture frame for a while now. 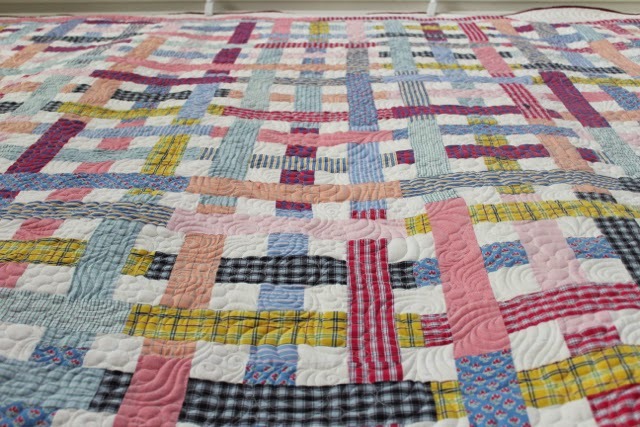 This quilt is for a 4 year old girl – the youngest of all the sisters who have worn these dresses. 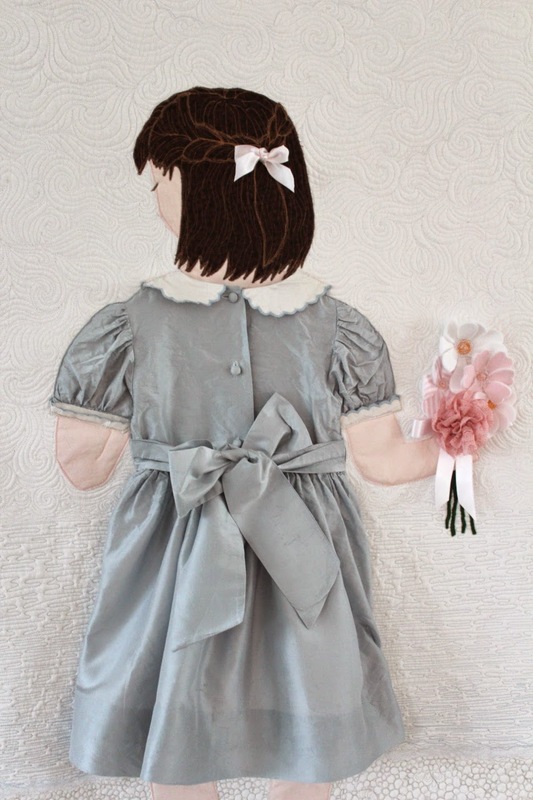 The back of the blue dress was so pretty with its buttons and wide bow – I knew that was the dress to use. 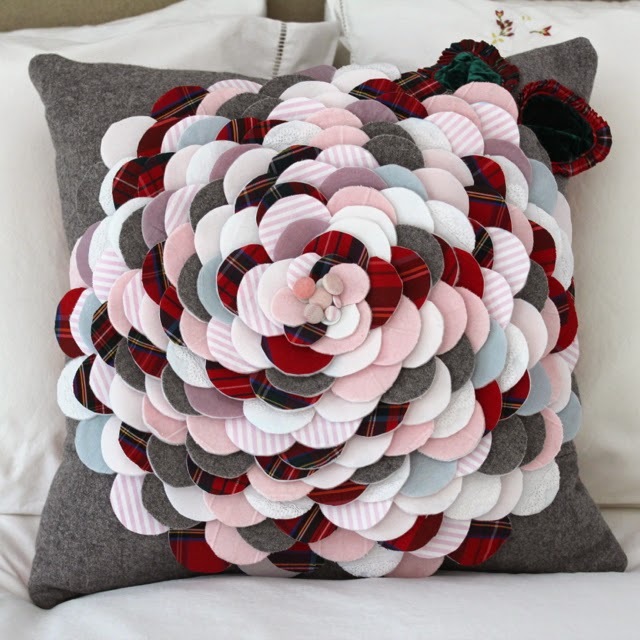 I used some petals left over from the memory pillow to create her flowers. 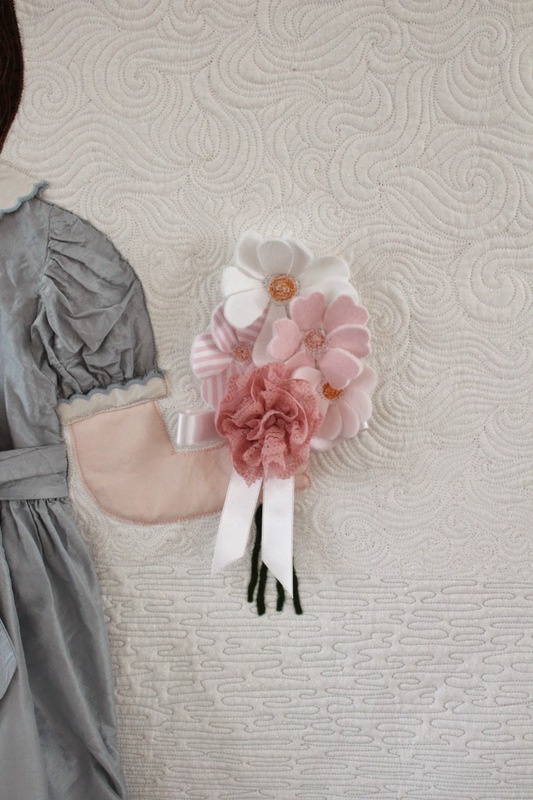 The ribbon on her flowers and in her hair are from the dresses. Her shoes are made from the grey wool dress. I used the remaining pieces from the dresses to create a ‘picture frame’ around the dress. 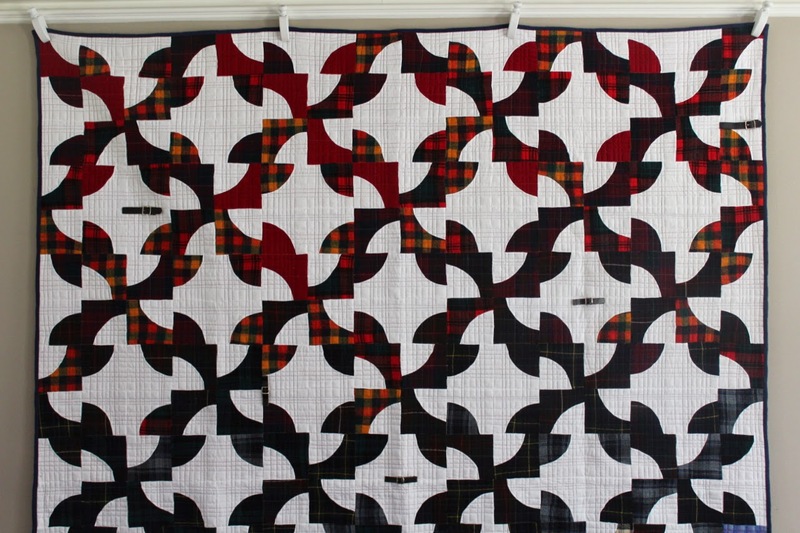 Mini orange peel is a little bit of a favorite pattern for me at the moment. You can take orange peel in some many different directions – it is a fabulous pattern to play with. 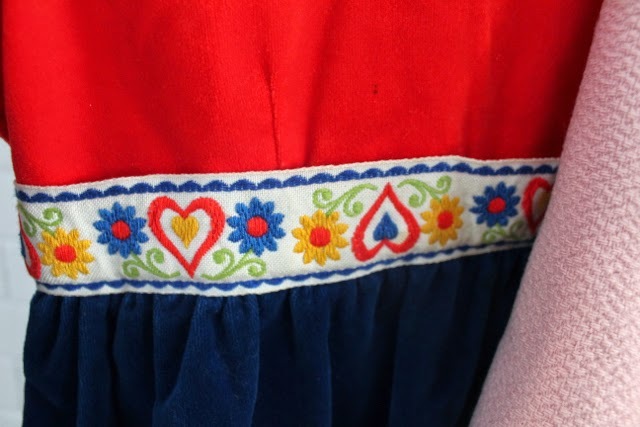 In the border there are lots of cute little details like lace, the stitched boats on the pink striped dress and the pleats and stitched flowers in the blue satin dress front. 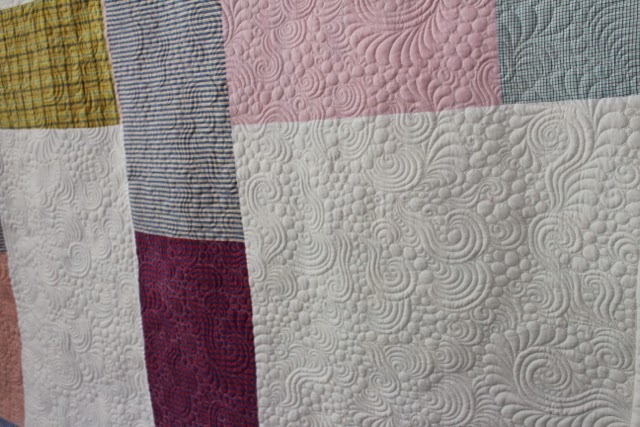 Here is some up close detail of the quilting around the girl. Therapeutic Mctavishing for the sky. She is standing on the shore looking out. There are a lot of pebbles and shells beneath her feet. Some of the pebbles are very small. Hair has become a small obsession of mine to take further next year. 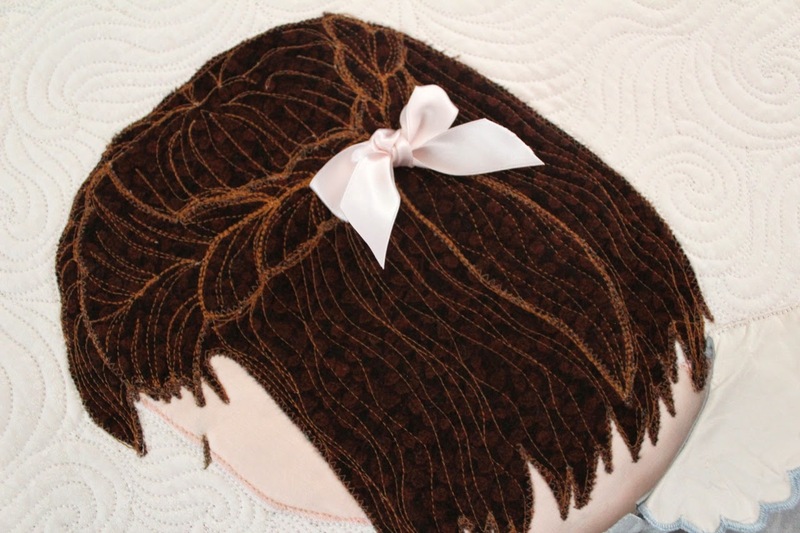 The braid is actually another piece of brown fabric appliqued onto the hair shape and then I quilted on top of the layers in a lighter thread color to highlight the shape of the hairstyle. It turned out really well. It sits wonderfully on a queen bed. I’m excited for the little girl to receive it. I’m planning it will get to her in time for Christmas. I really hope they enjoy using it. 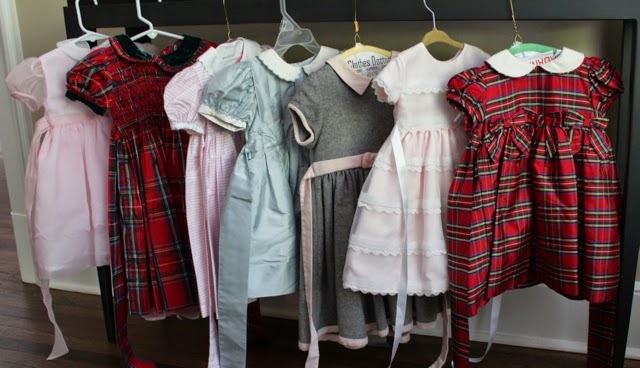 You might remember that I was given a beautiful array of toddler dresses from a mom who wanted a pillow made for her bed. A pillow isn’t very big. 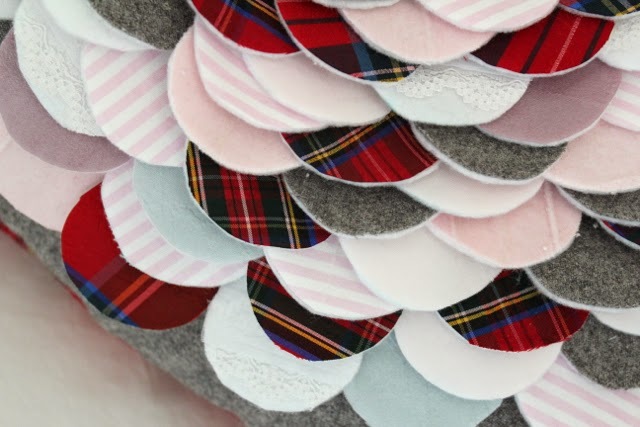 So to make something little that showed the material from all 7 dresses in an interesting way – had me stuck for a bit. 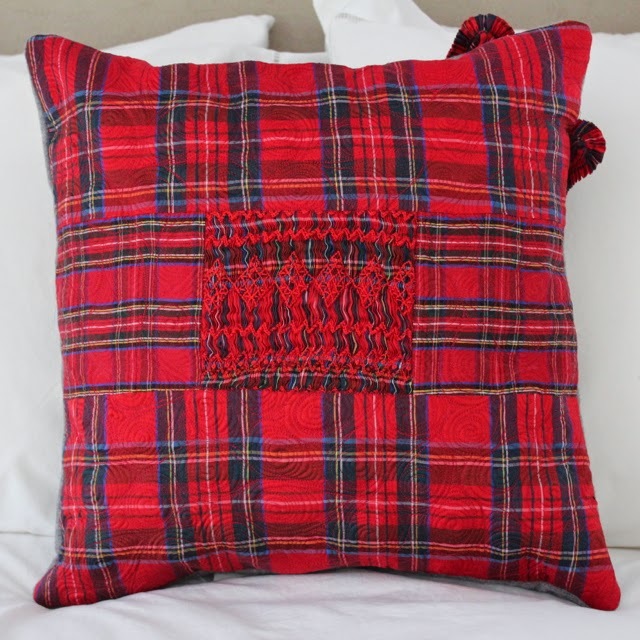 I looked at endless pictures of cushions (I think I would now get top marks in any cushion quiz!) 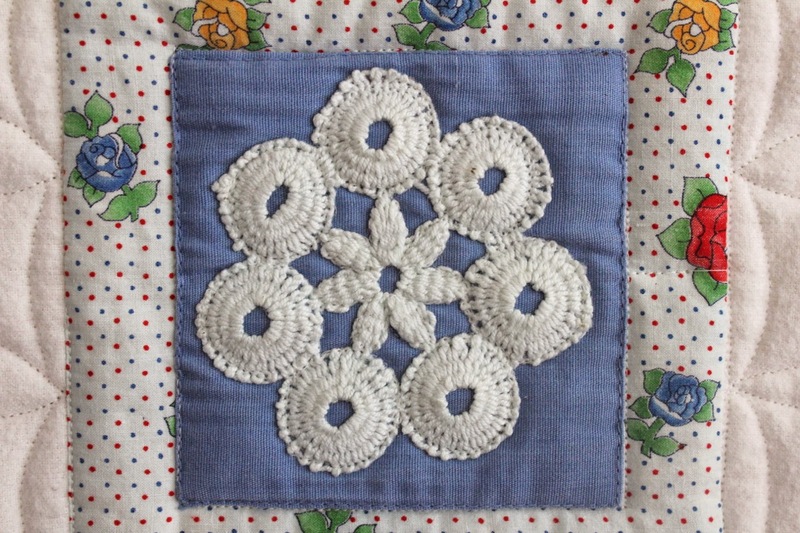 and finally decided to make a simple flower cushion. I stuck all the smaller bits of fabric left over from the deconstruction of the dresses to white felt using a strong fusible. 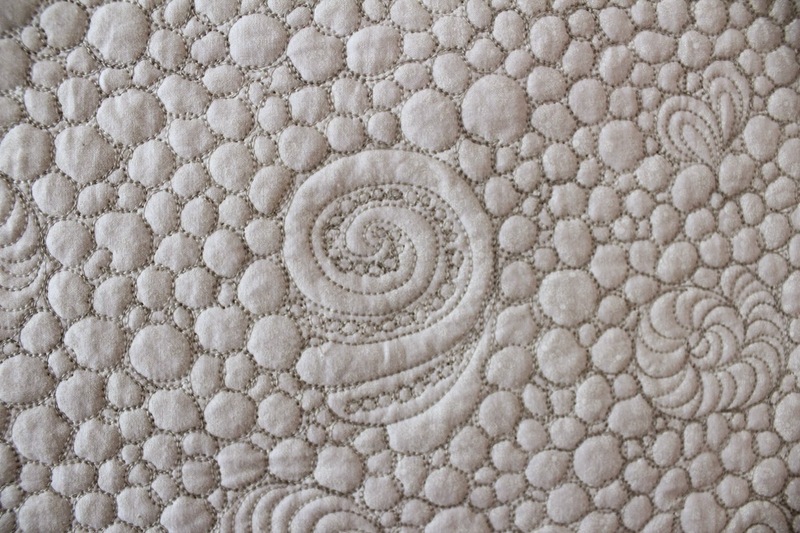 I cut out the petals and sewed them in circles – lots of circles! The petals even show case the lace and other cute details from the dresses. 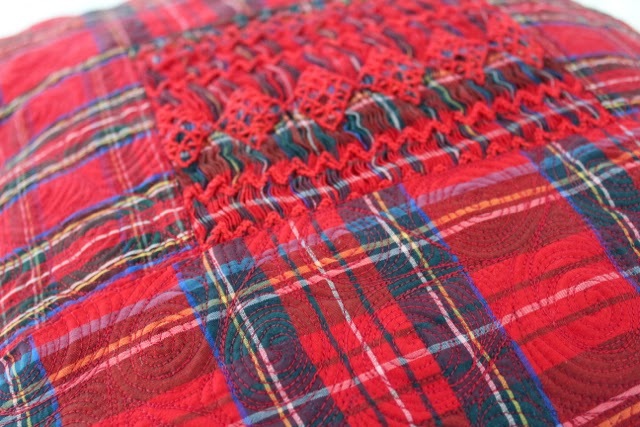 Because there were two red tartan dresses I used some of the tartan to make the back. 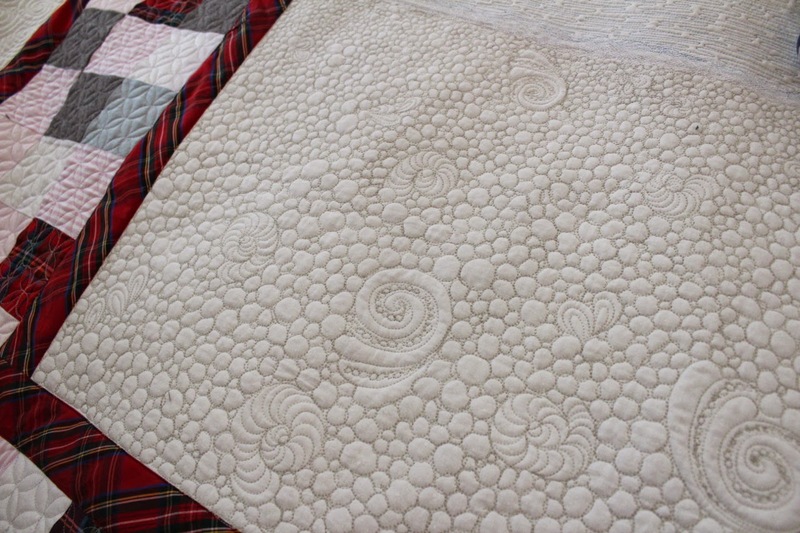 The smocking of one as the center of the back with some spiral paisley free motion patterns around it. 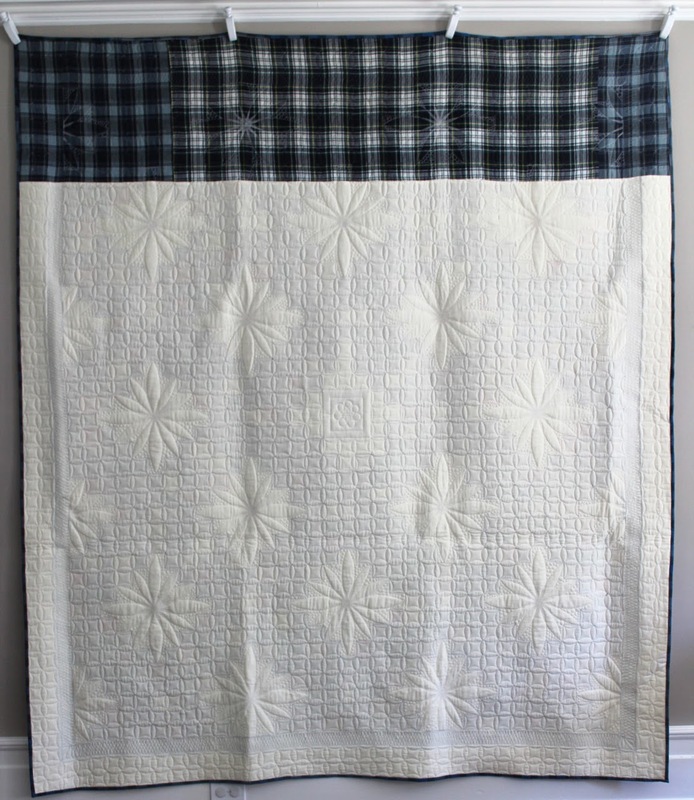 Almost reversible but I think the front is much prettier. 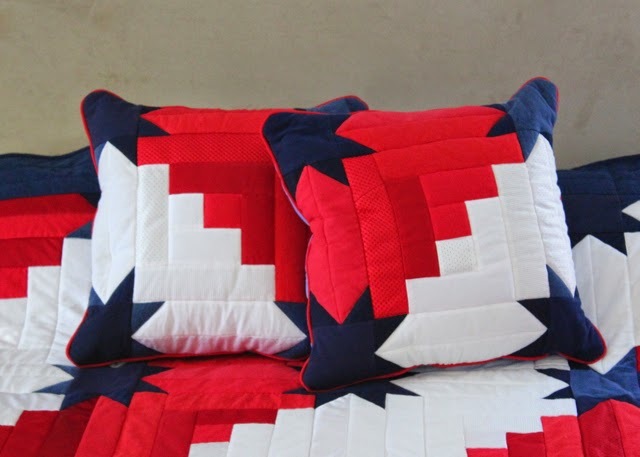 I was given a large amount of material for these quilts. 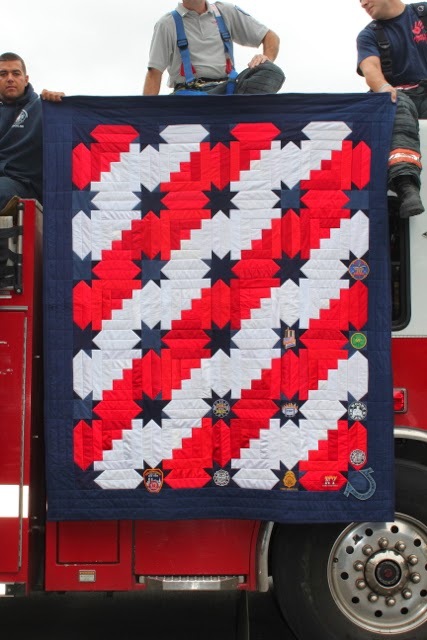 These quilts are made for two 5 year old twin boys whose father (a firefighter) passed away. 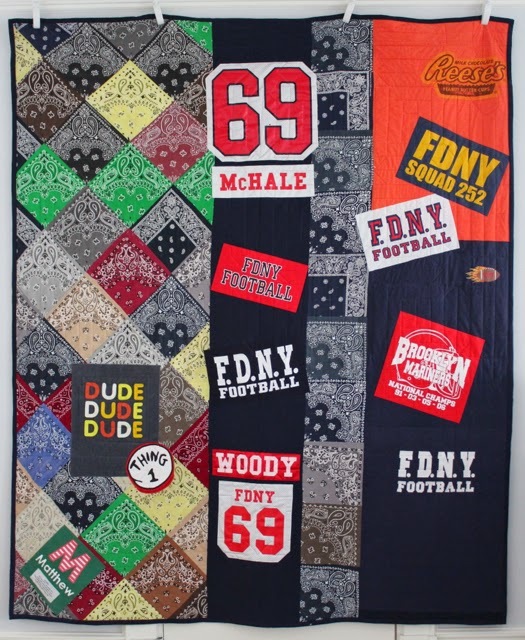 In the basket of materials I was given were t-shirts, mens white vests, bandanas, football jerseys, sports shorts – a whole lot of materials that you would perhaps never dream would go so well together into a quilt. 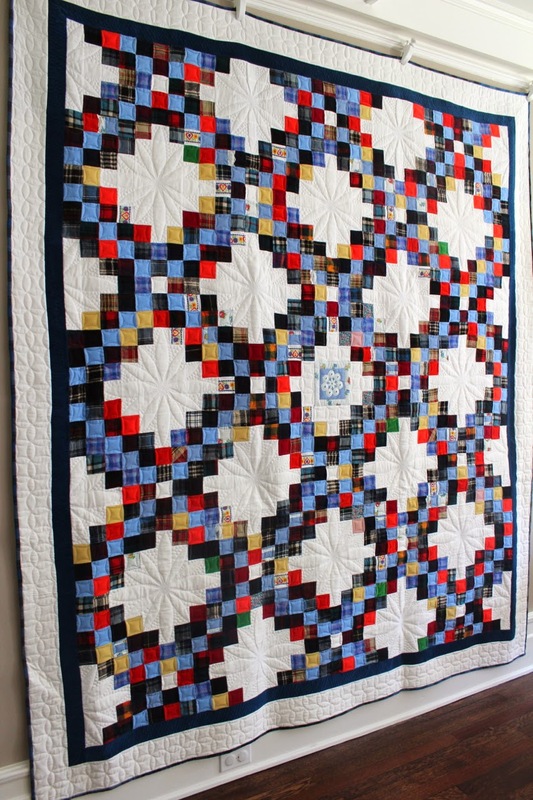 I mixed all the different materials together in their color groups and they look amazing. 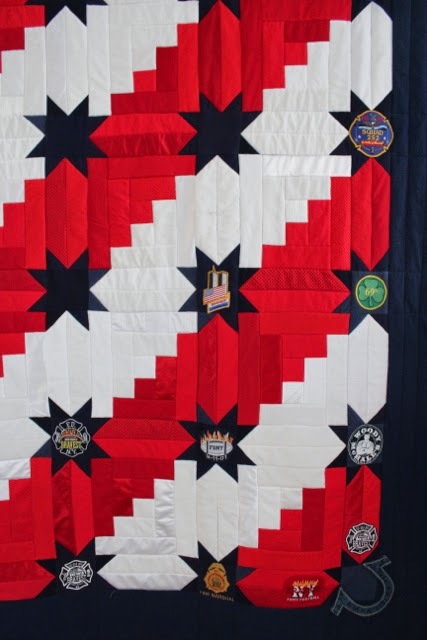 The family requested a large bold patriotic design and for the quilts to be similar. 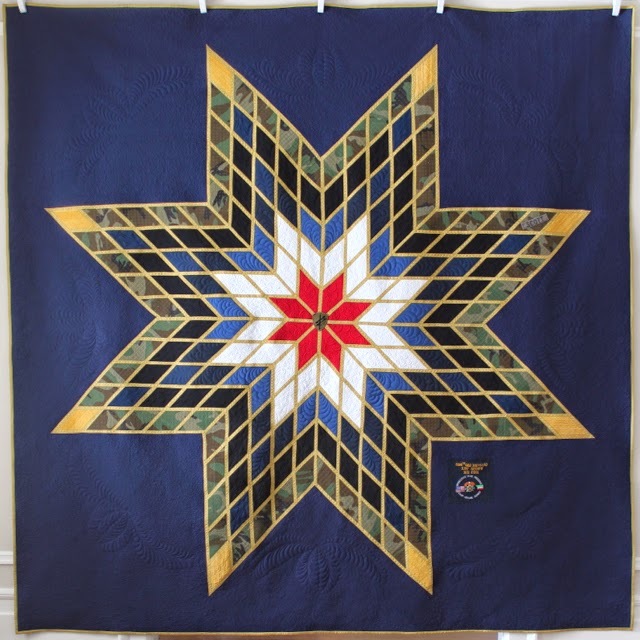 (The quilt design is adapted from the Stars & Strips pattern found on McCalls Quilting. 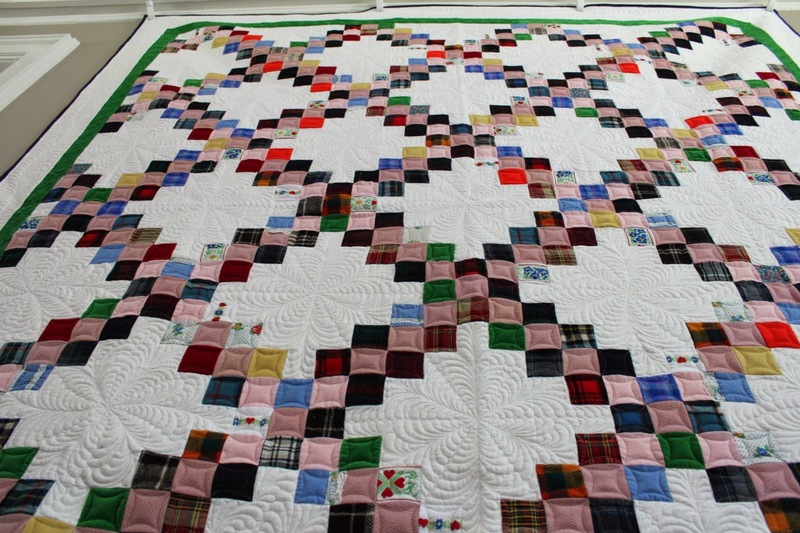 The entire quilt from the front to the back to the binding is made from the clothing. The project did take me a longer longer than I had planned. But I think it was utterly worth it. 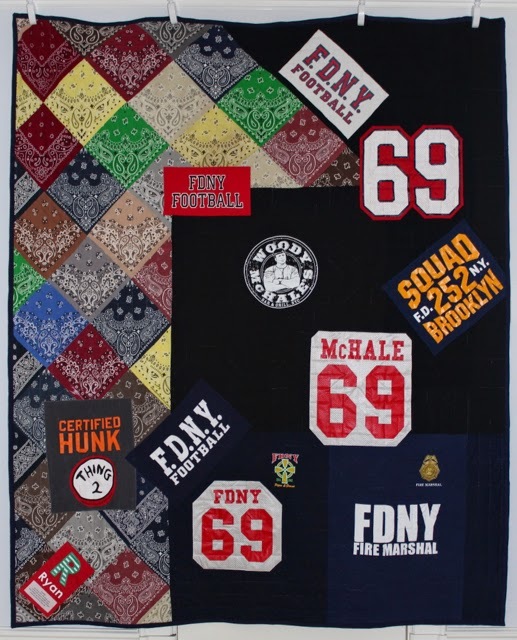 The firefighter was an owner in a local bar – so the back of the quilts are styled in the way that you might find signs and registration plates tacked on a sports bar wall. Scattered – but with a purpose. 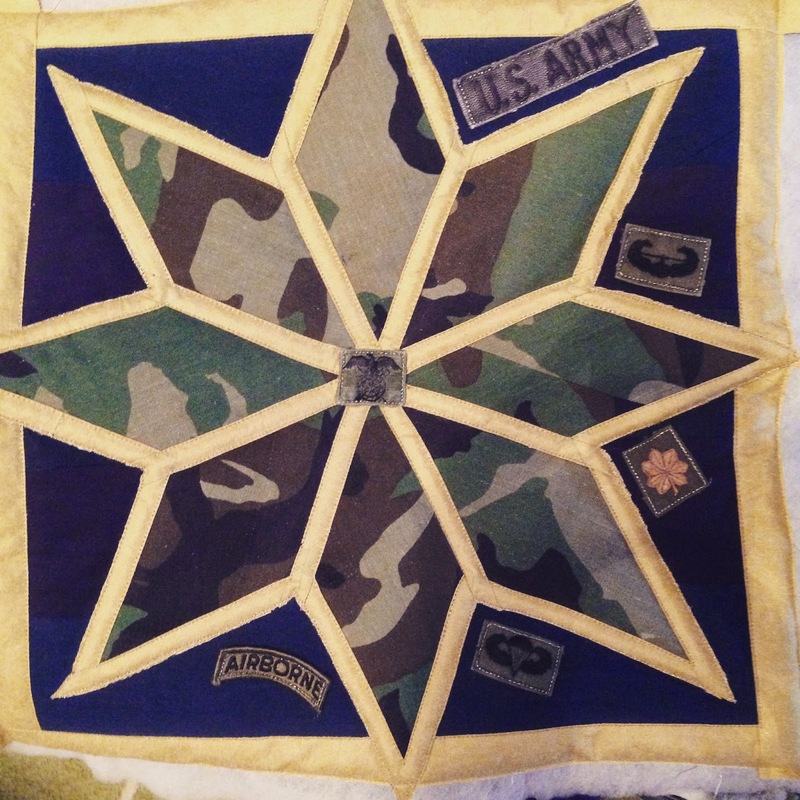 A large proportion of the backs are made from his bandanas – cut into quarters and sewn on point. 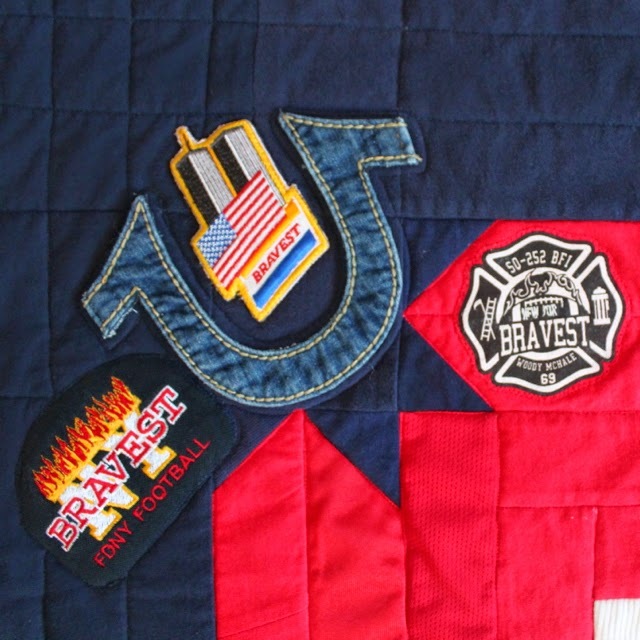 Various badges and emblems from the t-shirts are also sewn to the front of the quilts. 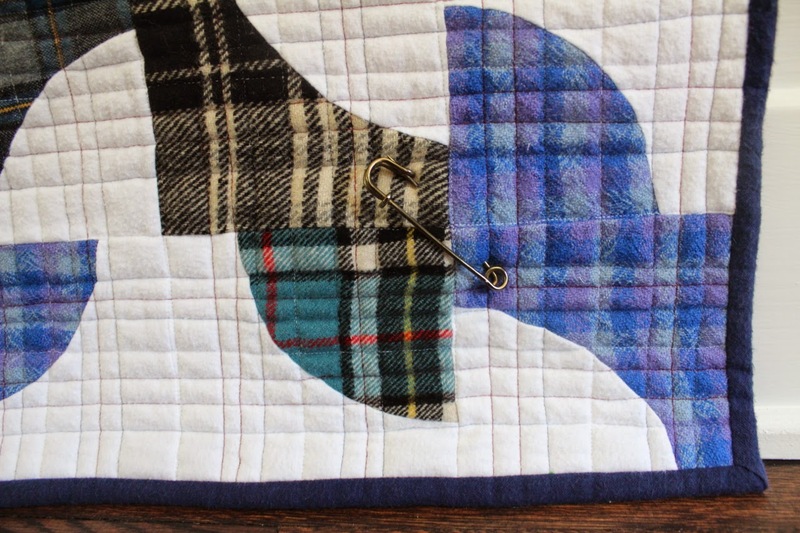 Also – my favorite part of the quilts is the denim horseshoes – taken from the pockets of his jeans. 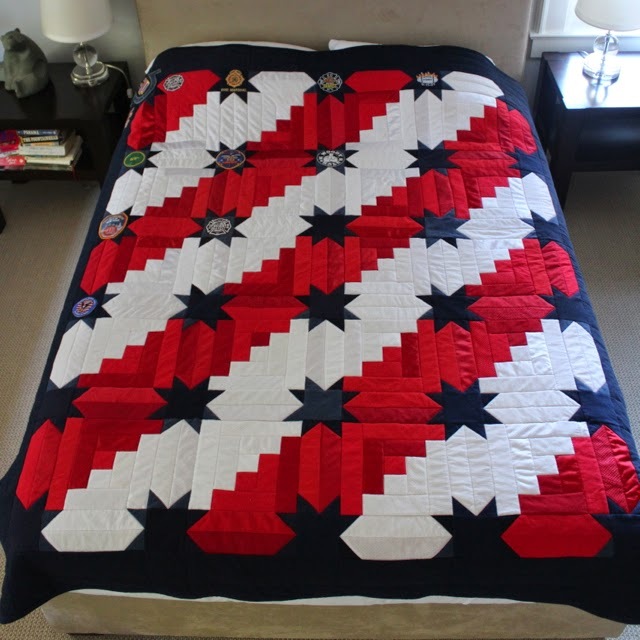 The stars and stripes section of the quilt fit perfectly on a queen sized bed. 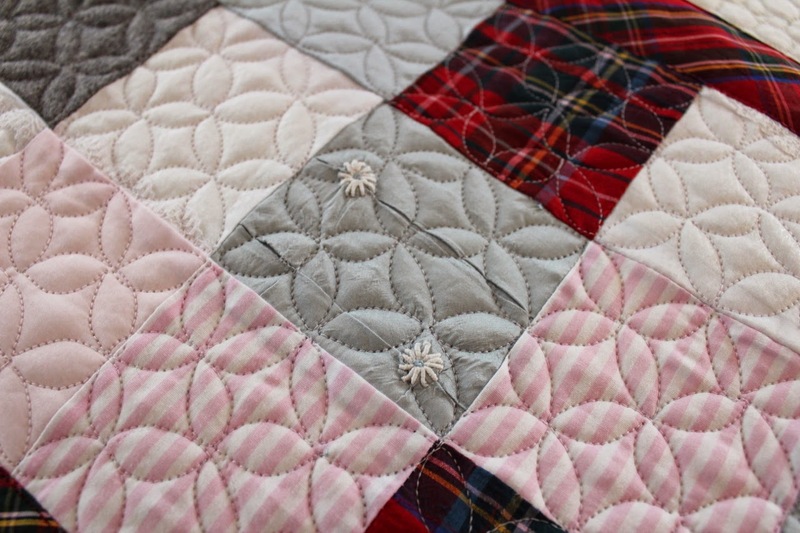 The biggest shocker for me with the project is how I quilted the quilts. 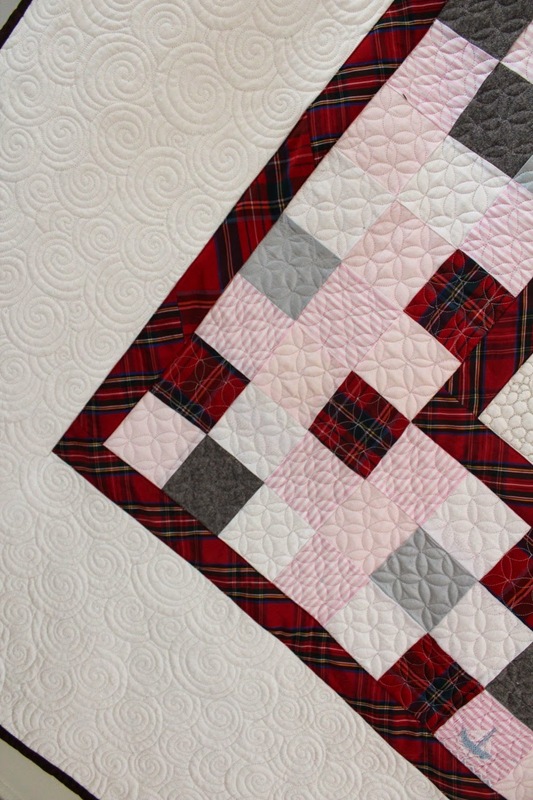 No fancy quilting. Just simple in the ditch. 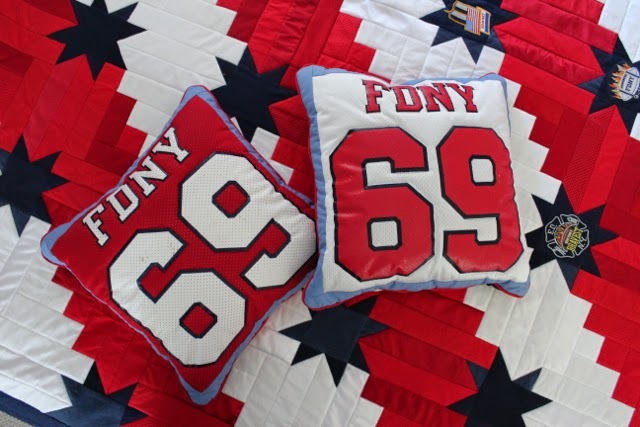 And of course some matching pillows which have his football jersey number on the back. 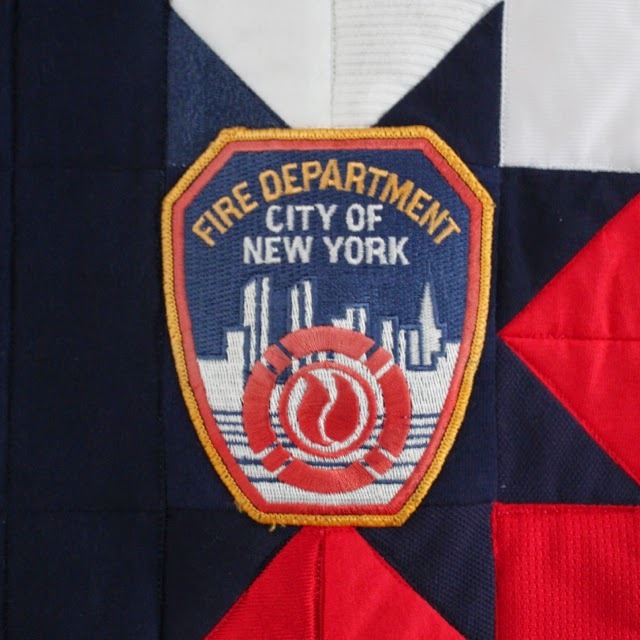 And while I enjoyed taking these quilts for a photo shoot at my local fire station with some not too shabby firemen – I have to admit that I got rather teary when I was sewing on the labels for these quilts. 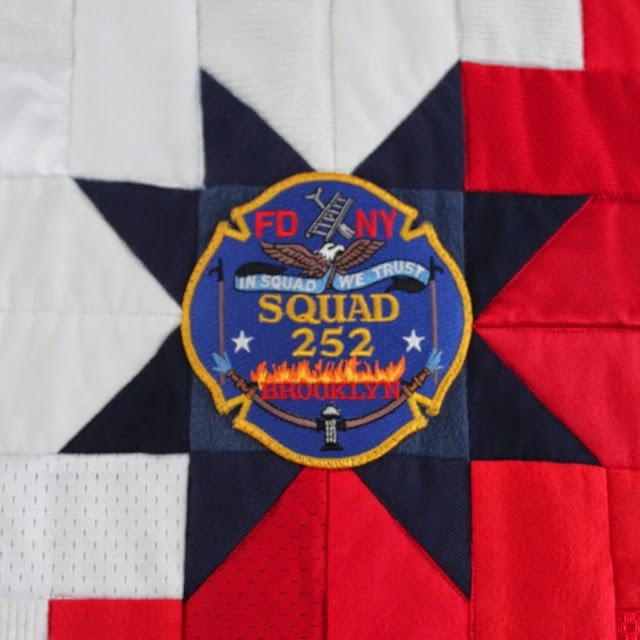 A wonderful family man – a man who saved and protected – lost all too soon. 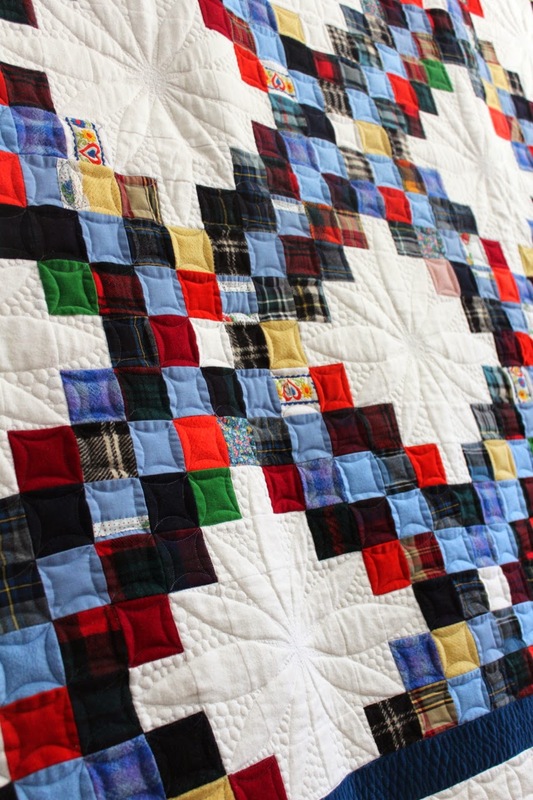 This is a quilt made for a family whom lost their father. Their father loved to wear bright colorful shirts. 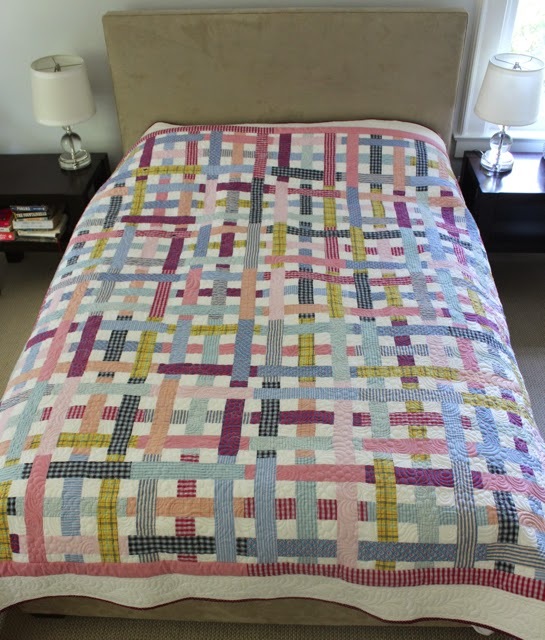 I don’t often see patchwork patterns that I immediately want to make but when I saw this pattern called Simply Woven by Jessica Kelly – I knew that it would make an amazing quilt from recycled materials. 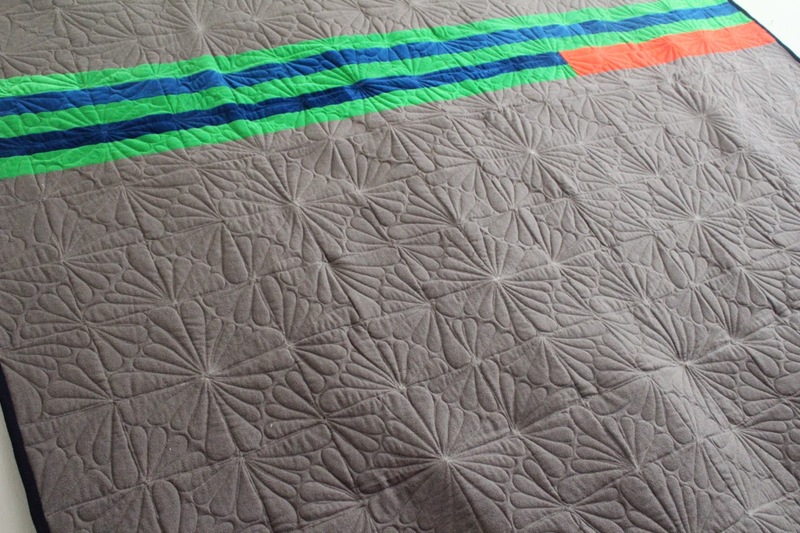 I made my quilt a little larger (it is probably around a king sized quilt) – I had so many shirts I didn’t want to waste them! 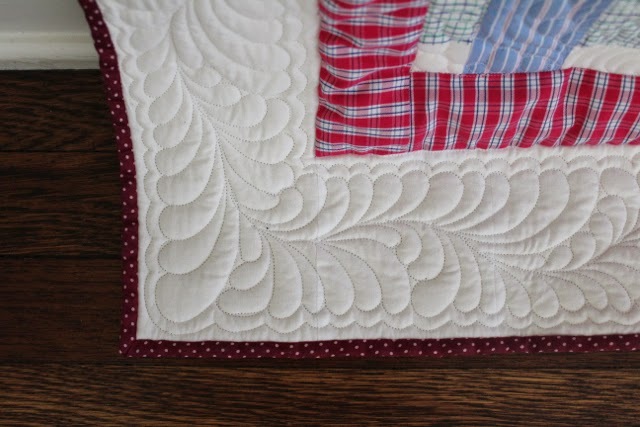 I also added a border to my quilt as the family have more traditional tastes and I think formal borders always make things seem a bit more traditional in style. 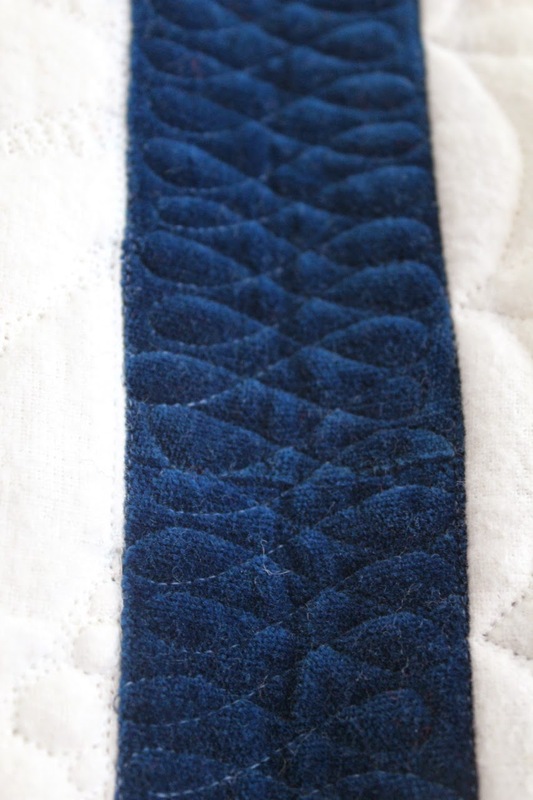 … my feather corners are getting better. 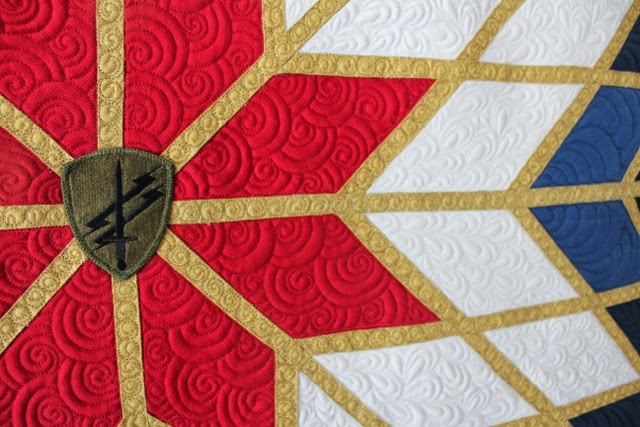 … it is the back clearly shows all the detail. 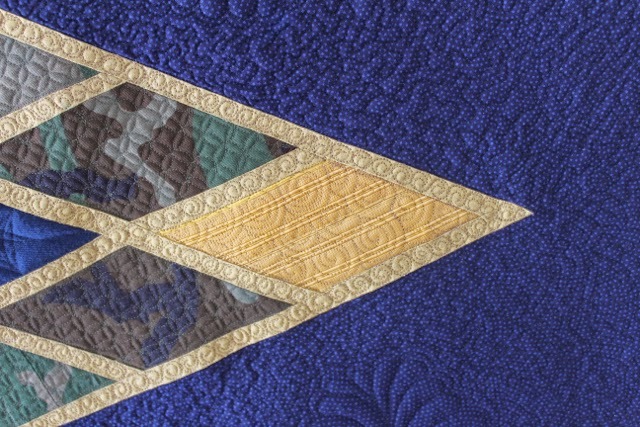 I tried to mimic a little bit of the woven element on the back too. 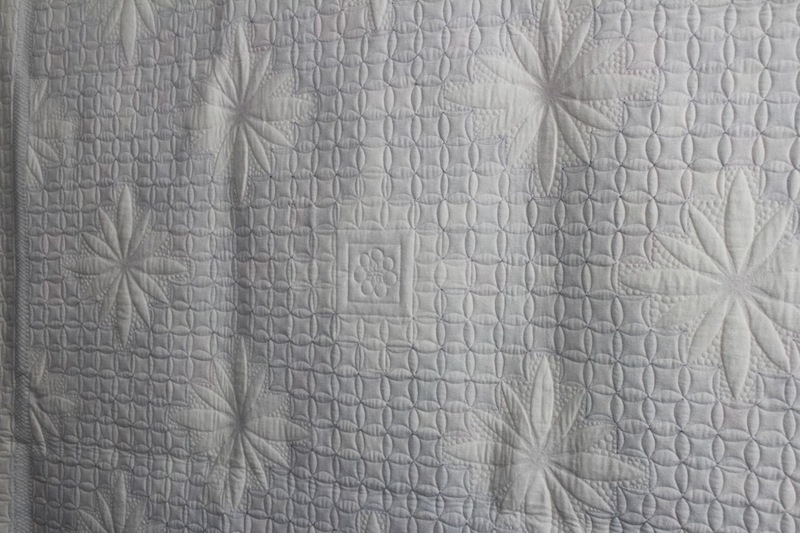 And in case you don’t believe this is made from men’s cotton shirts – there are little bits on the front to remind you. 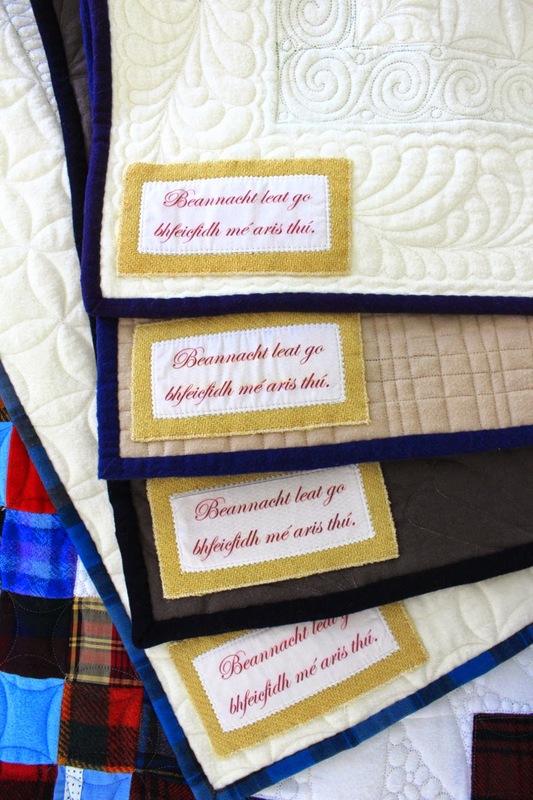 Often I add labels to the quilts I make – often I use the tag line ‘handmade with love’ those who know me well know how true this tag line is. 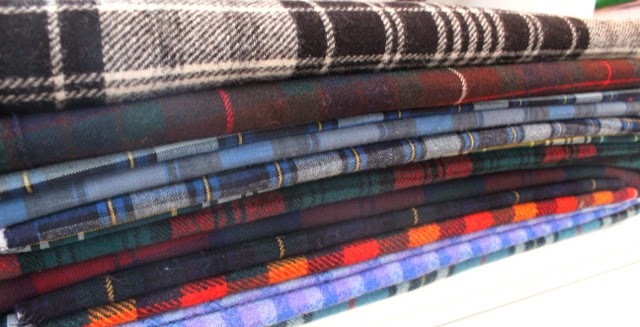 But for the Kilt &amp; Coat Quilts – these have a different label. 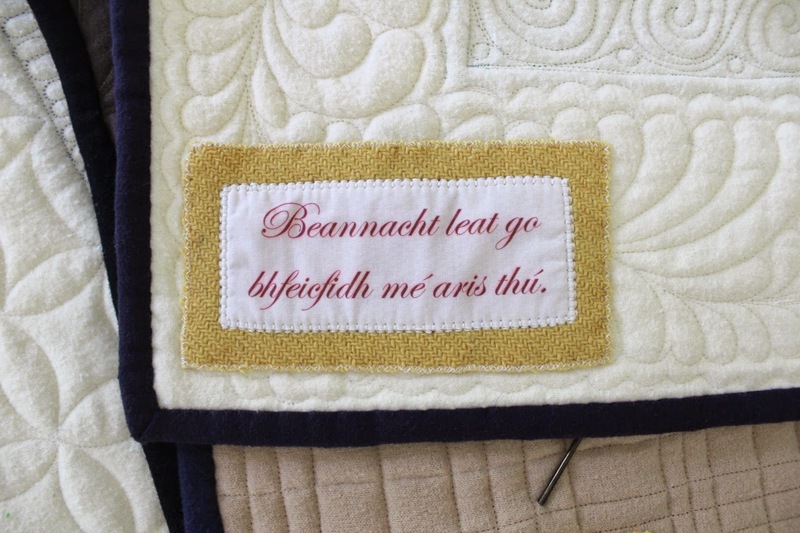 “Beannacht leat go bhfeicfidh mé aris thú” is Irish Gaelic for ‘Until we meet again’ – or a literal translation is ‘Blessings until I see you again’. 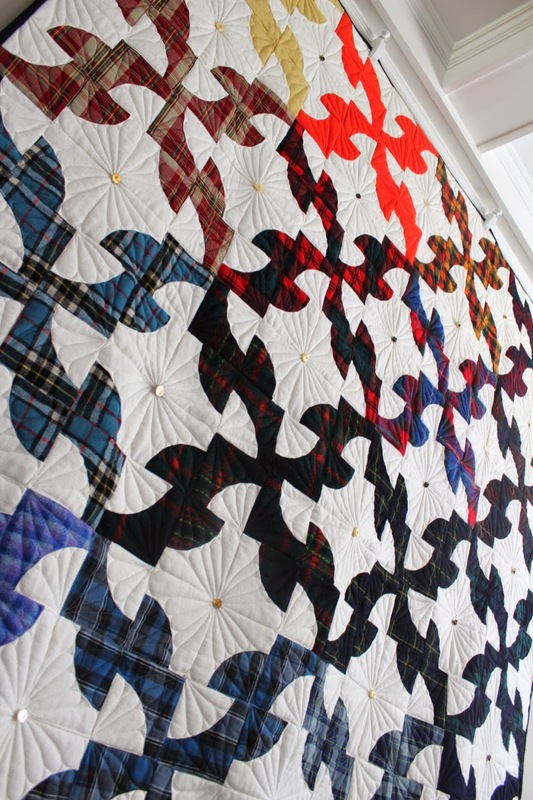 Which for these quilts with deep Irish roots &amp; laden with Irish kilts – was so perfect. 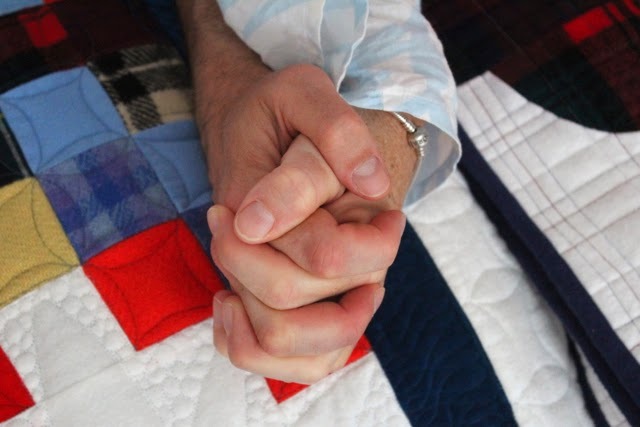 I simply ADORE these photos that I took of the siblings when they picked up the quilts. 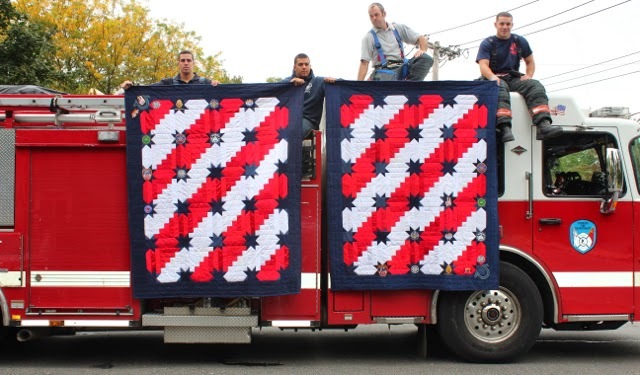 The pictures – to me at least – scream what my Quilting A Memory project/charity is all about. 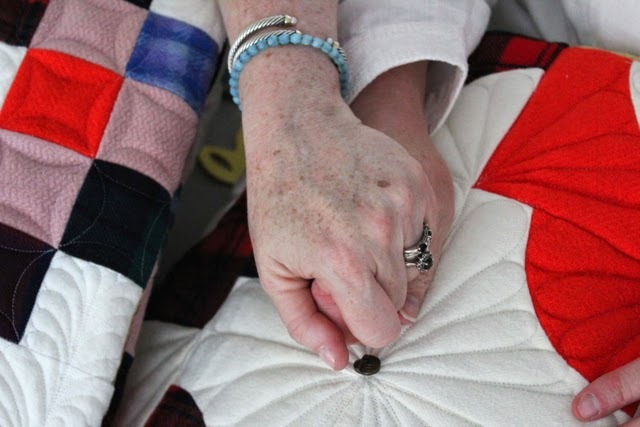 I am working on more Memorial & Memory Quilts and I look forward to sharing the results with you soon. 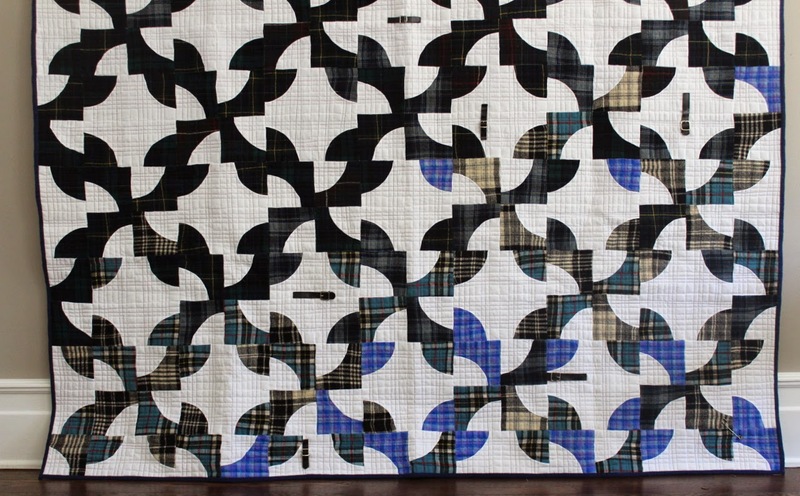 This is the final quilt in a series of 4 quilts made for a family with deep Irish roots. 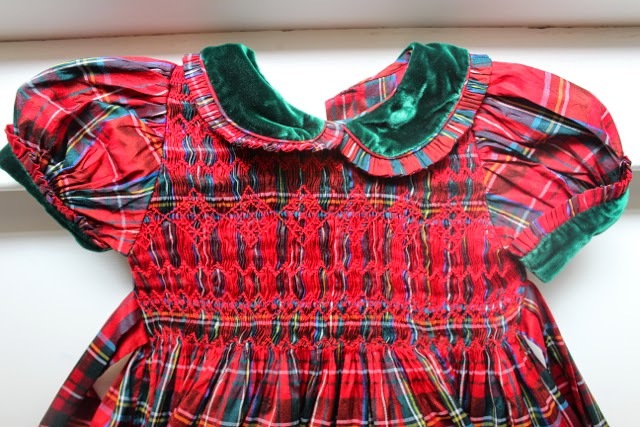 The father would travel to Ireland over the years and bring back Irish kilts and traditional dresses. 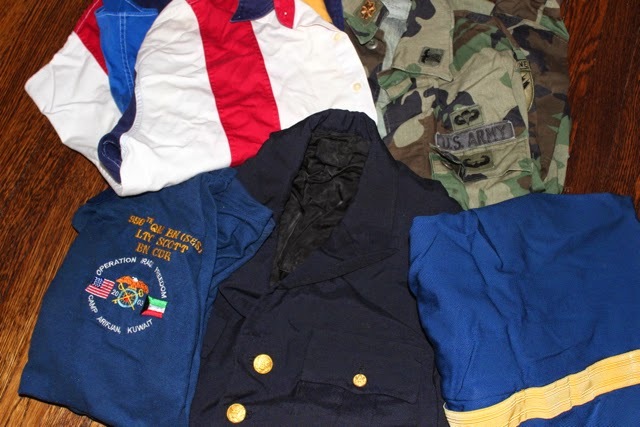 All these garments were kept alongside some gorgeous childhood coats. 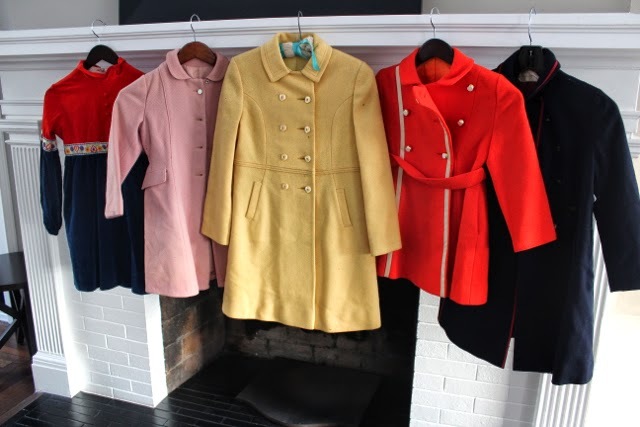 coats & kilts that their mother had collected. 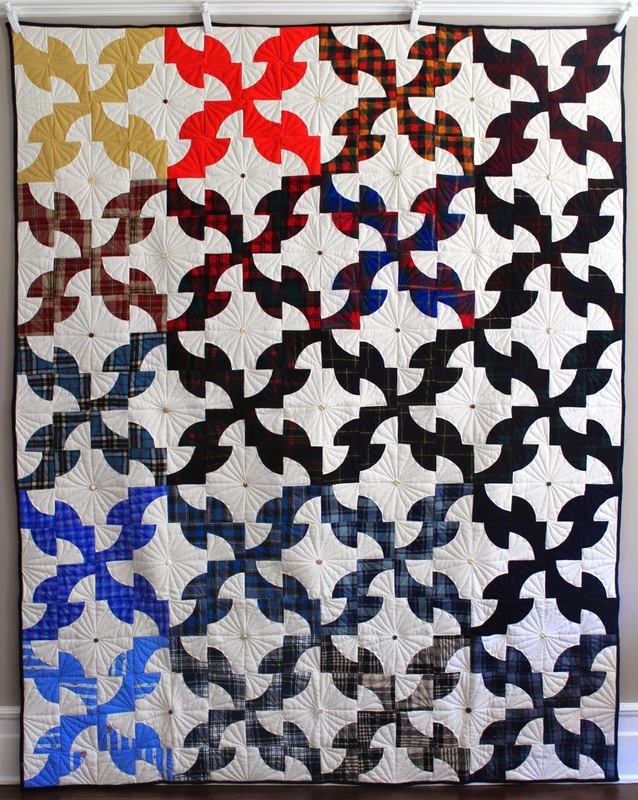 You can view the first quilt here and the second quilt here. 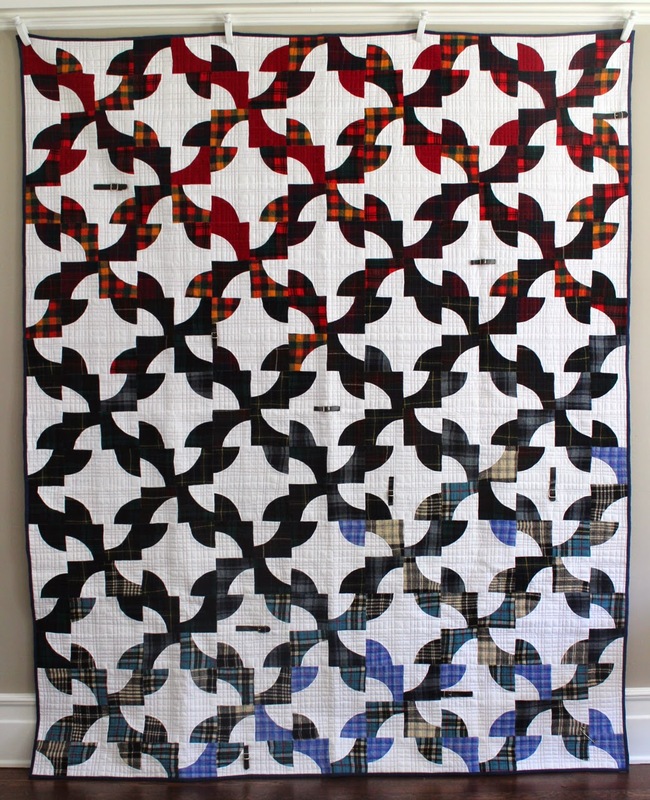 This is the 3rd quilt I finished – it is another Drunkards Path pattern. 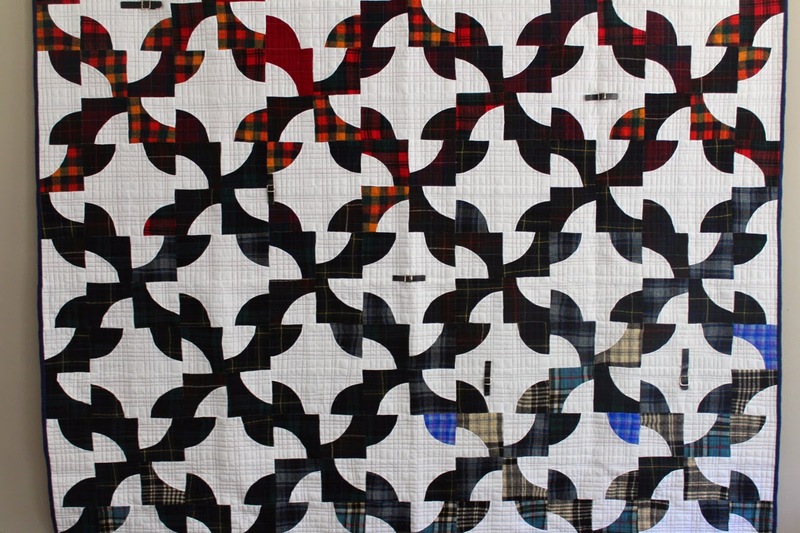 But I hope I have given the traditional pattern a little twist. 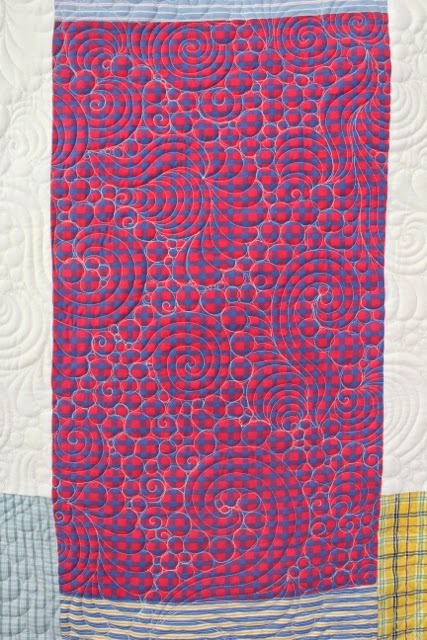 I quilted this quilt in straight lines using blue, red & white threads – I tried to mimic a sort of tartan pattern in terms of the lines placement & order. 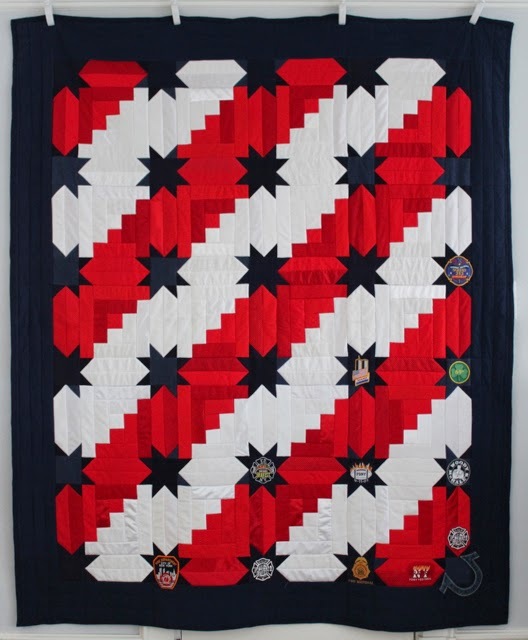 I have had several people tell me recently that straight lines are perceived to be simple – but let me assure you – straight lines – in any direction – with any machine – are not at all easy and anyone who can pull off perfect straight lines – line after line after line – gets my award of quilting valor. 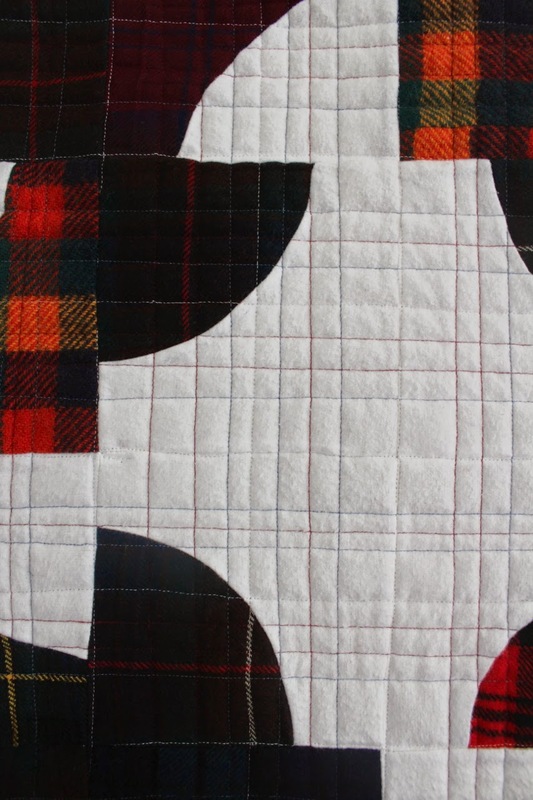 So while my straight lines might not be 100% perfect – I do think the idea of quilting a tartan quilting design ontop was accomplished. 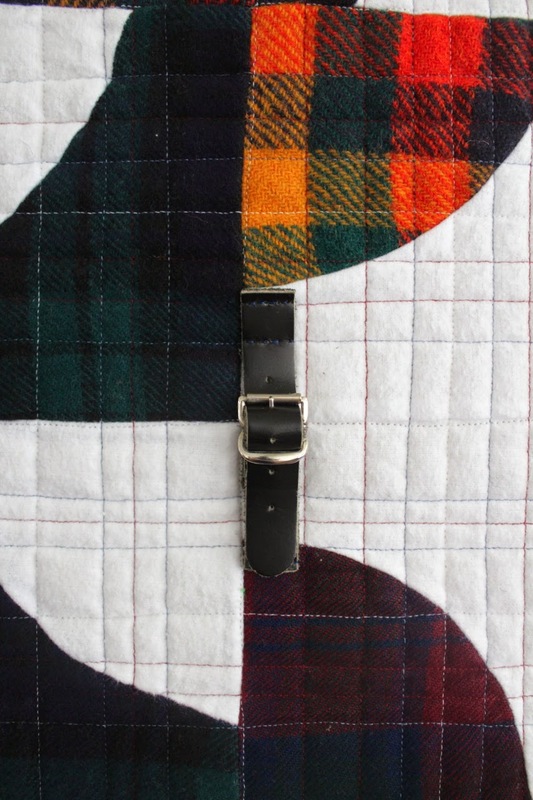 I also sewed all the different the buckles from all the kilts back onto the quilt. … but then there was a little hiccup. 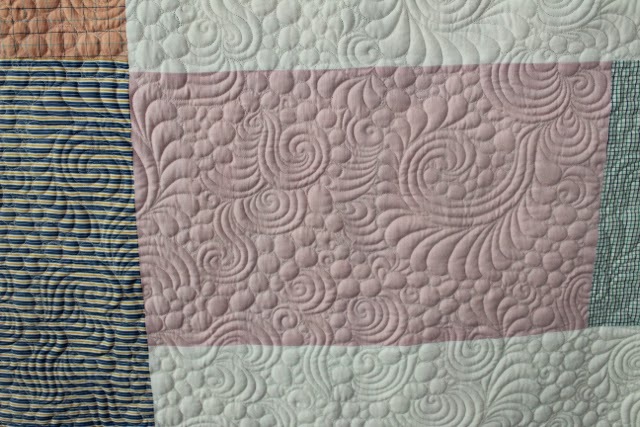 Part way through this quilt I had an ‘oh no I think I’m making a horrible mistake moment’ AND the timing on my machine went AND I had my thyroid removed. 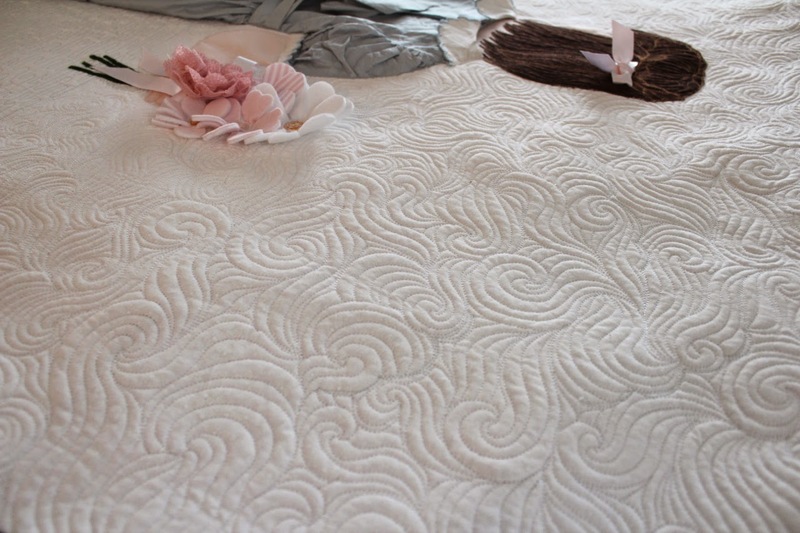 The afternoon I got back from hospital my lovely handiquilter dealer was there in my bedroom fixing the timing on my machine while I snored off the results of my sleep deprived hospital night and the rather long lasting results of the anesthetic (utterly embarrassing.) And the next morning I was up continuing the straight lines – still unable to speak or drink any liquids. 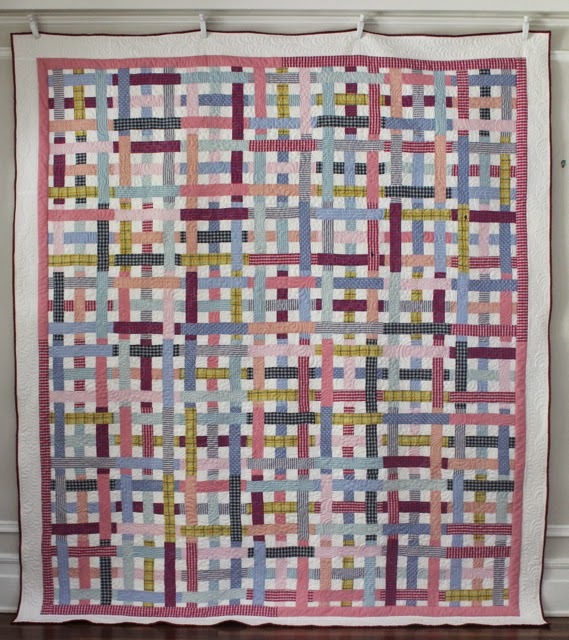 It was a tough couple of days – but I kept on quilting lines – and gradually my initial vision began to come together & now I am really pleased with this result. 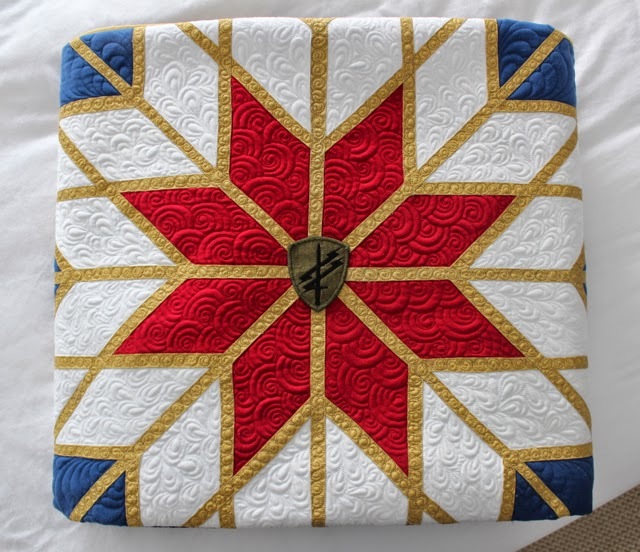 I really love the buckles on the quilt (I hope the family do too!) 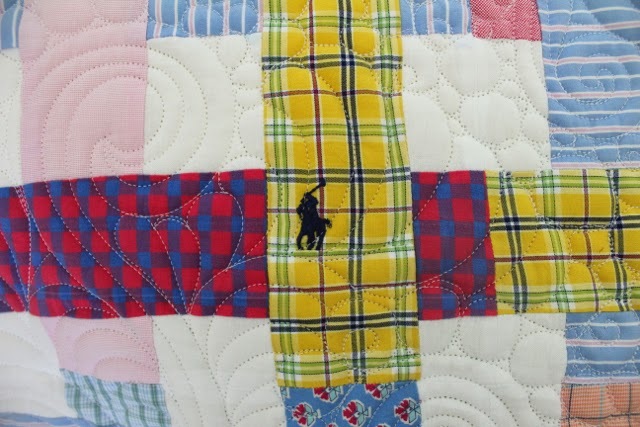 I suspect they might have been discarded otherwise and as this quilt is for the only brother in the family – I like the masculine edge the buckles give the quilt. 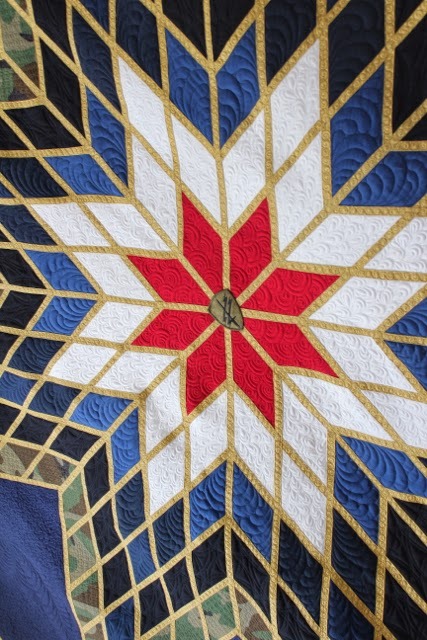 And this quilt has my favorite bit out of ALL the four quilts on this quilt. 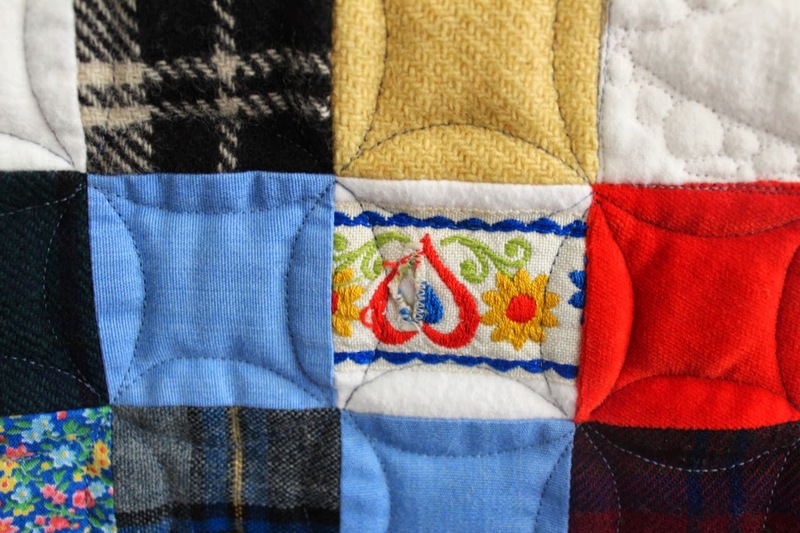 A large kilt pin in the bottom right corner!! 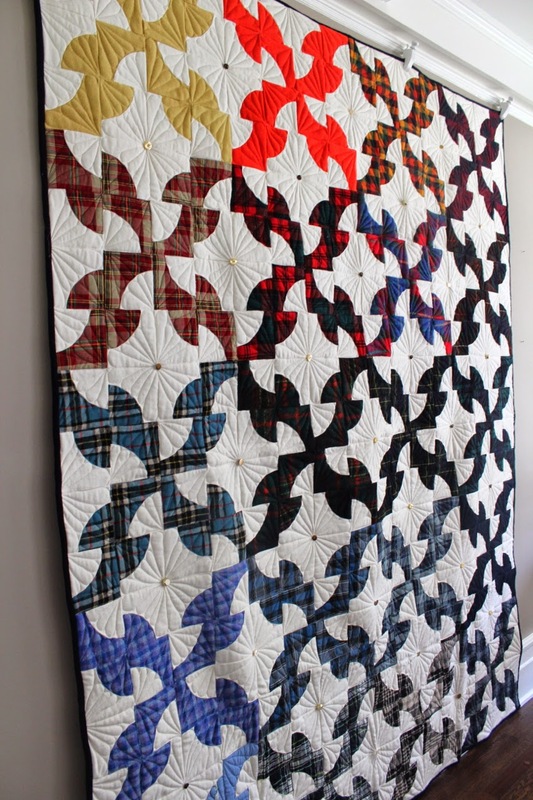 This is the 2nd quilt that I made for a family from a box of childhood coats & kilts that was discovered in their mother’s attic when she passed. 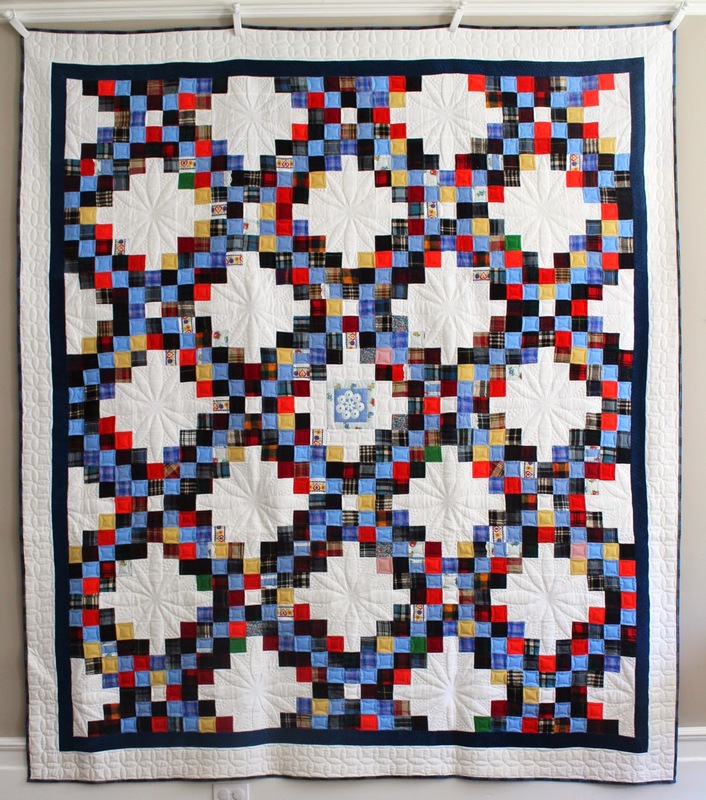 You can view the first quilt here. 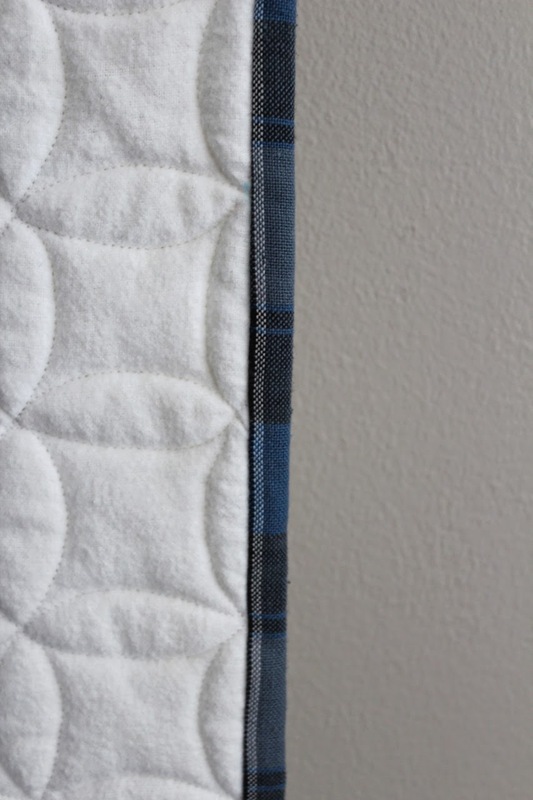 This time I’m sharing the back of the quilt first – because it is kind of fun, modern & minimal. Can you guess what the front design is? 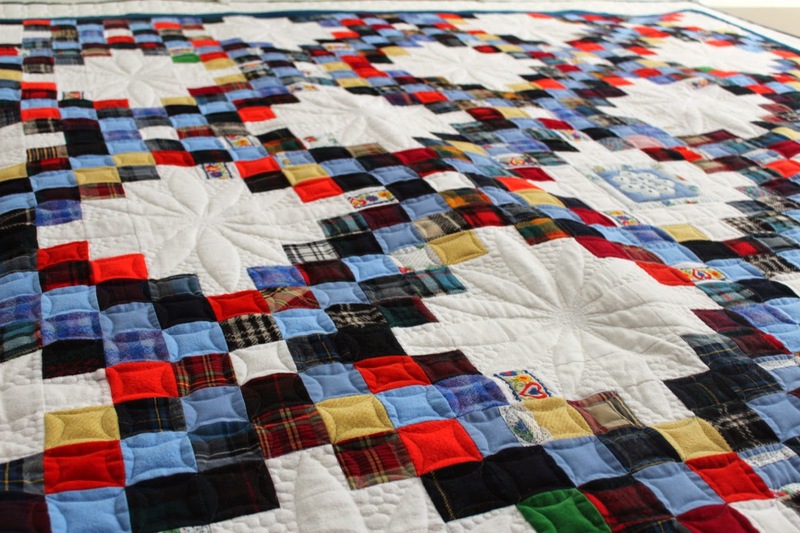 Of the four quilts there are two Irish chain quilts and two Drunkards Path quilts. 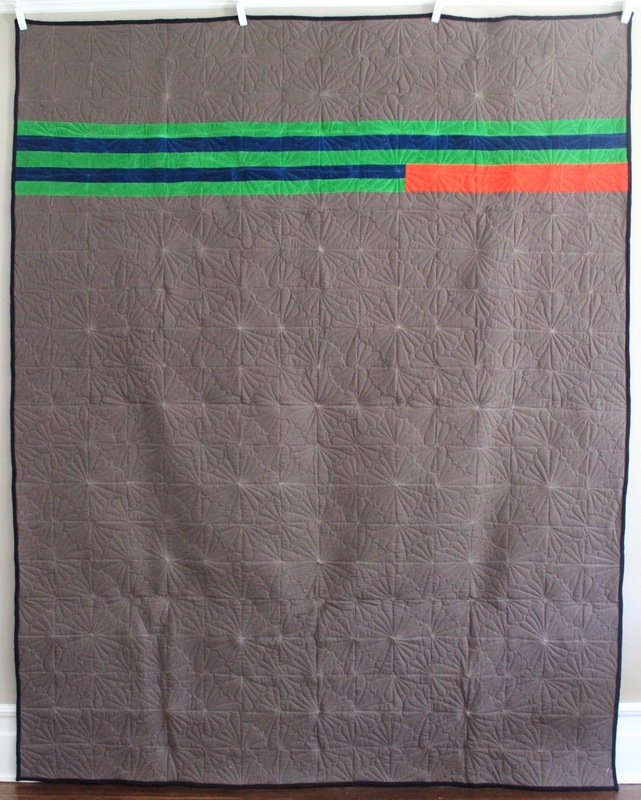 This is the first of the Drunkard Path quilts. 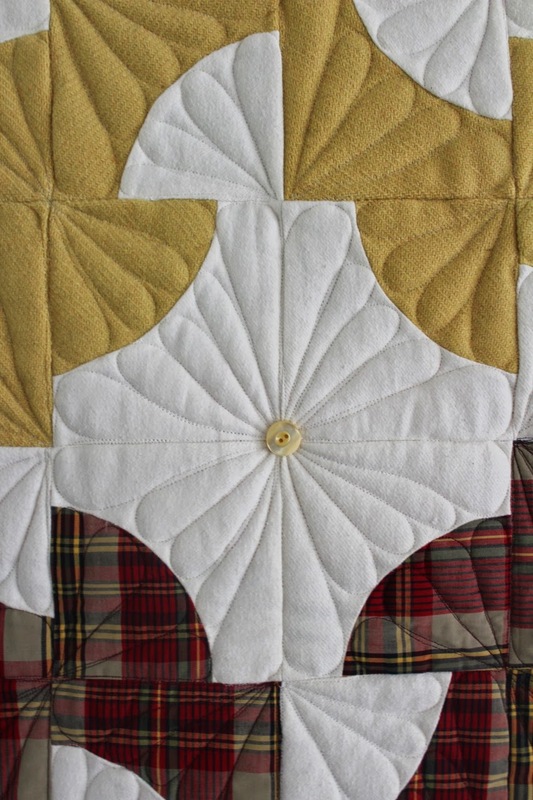 I quilted the quilt in a large curved fan design. 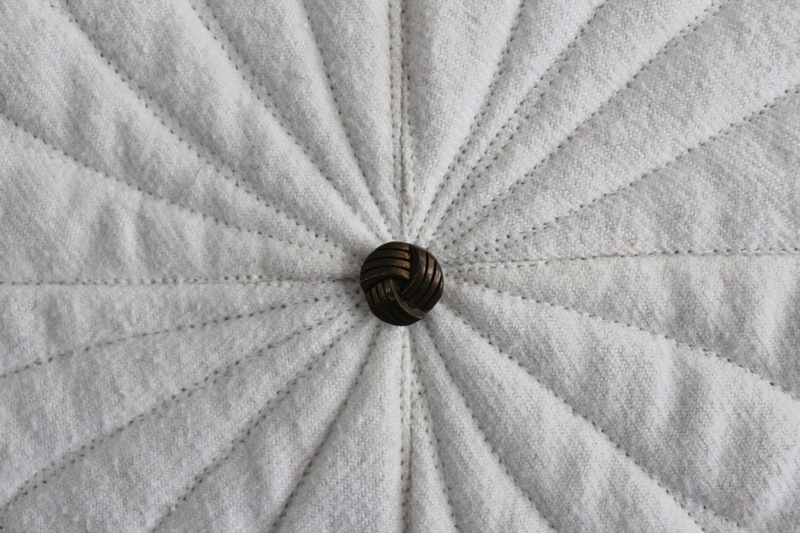 In the center of each block I sewed a button. 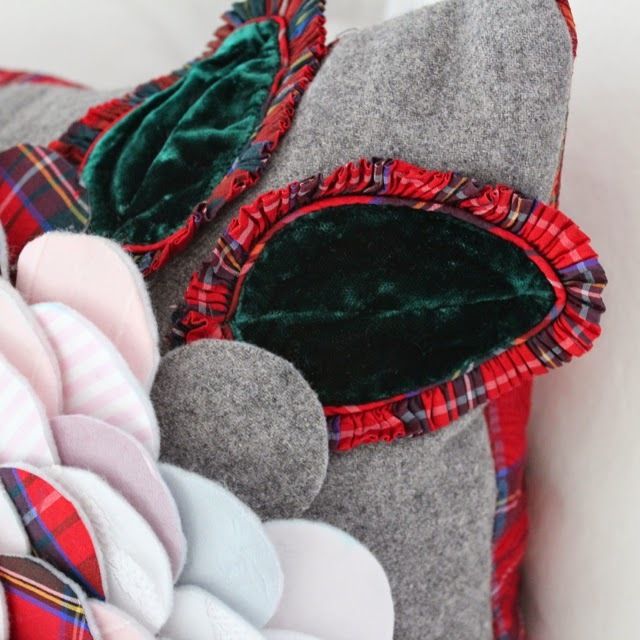 Some of the buttons are from the coats and others are from the kilts. 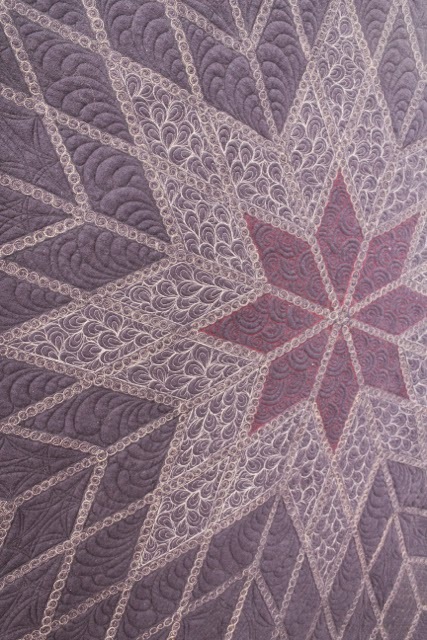 There is a total of 20 different fabrics from different garments in this quilt! 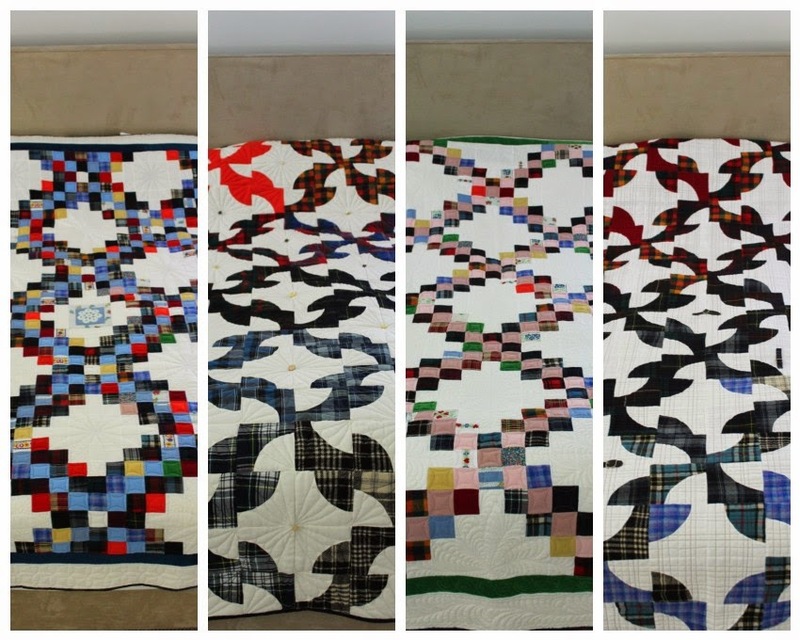 I have been working on these quilts – four in total – for a long time. I am excited to share the results with you. 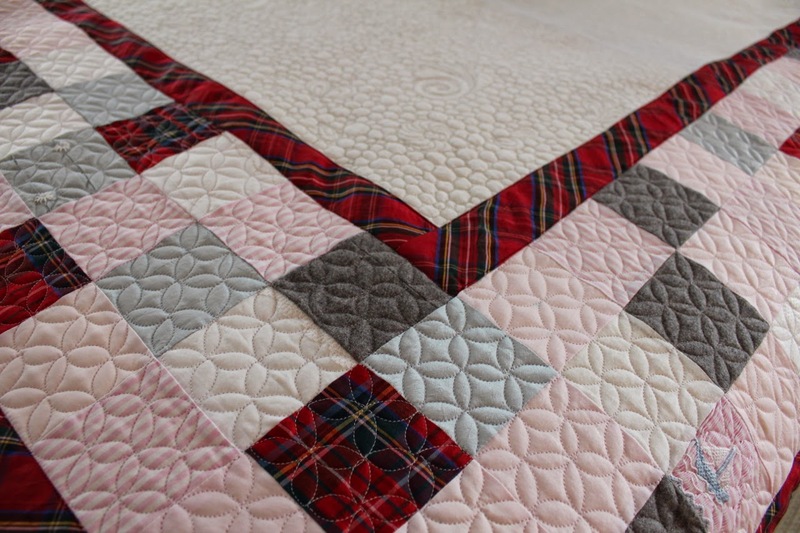 I decided to add some white flannel to all the quilts – flannel because it is soft and snuggly – but also because it compliments and blends into the texture of the wool kilts and coats. 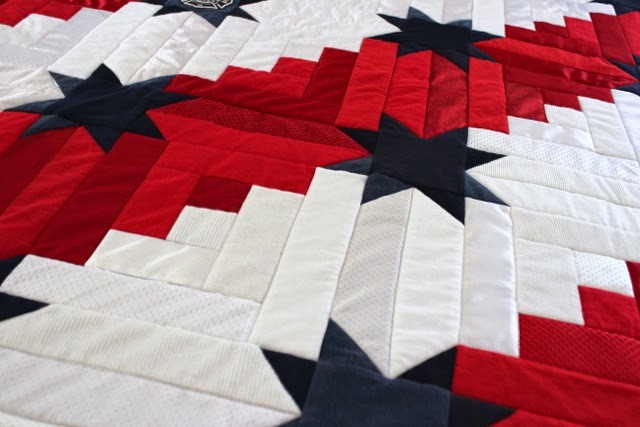 All the squares were cut to 2.5″x2.5″ and are 2″x2″ finished. I was very careful when I took the clothes apart to preserve all the details. 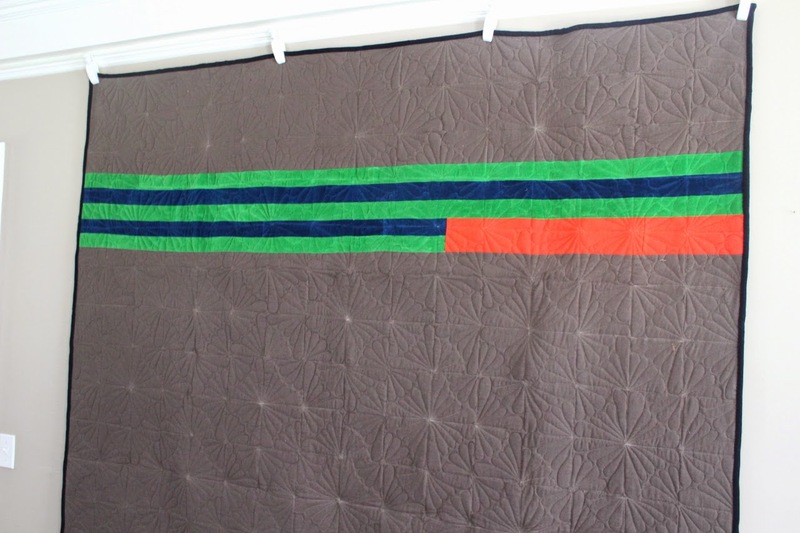 I took the ribbon off and reattached it to strips of flannel to use as squares. 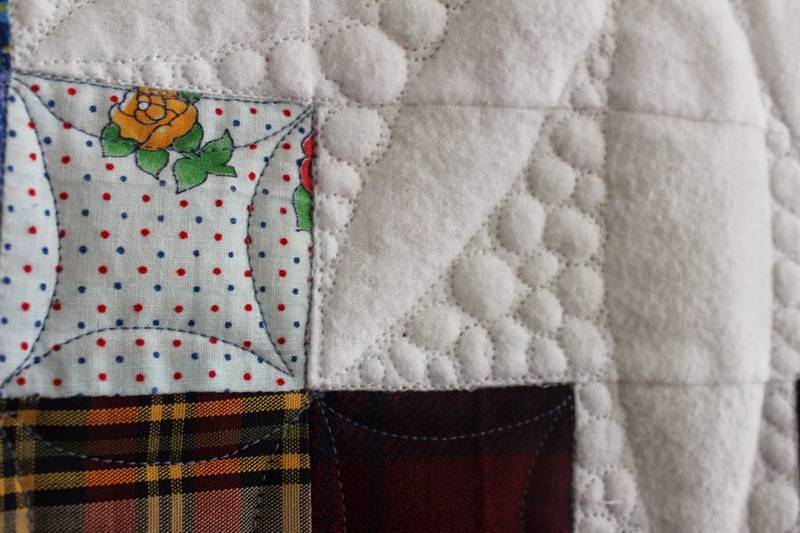 I didn’t want to waste any ribbon detail so there is a button hole included in one block. I left some trim and lace on in some places. I love how you discover something new in every square. 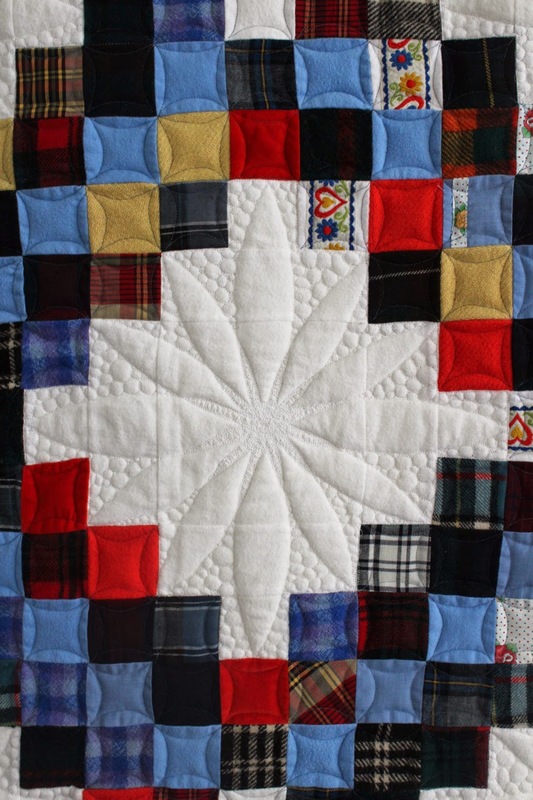 The center of this quilt is a panel from a blue cotton summer dress. 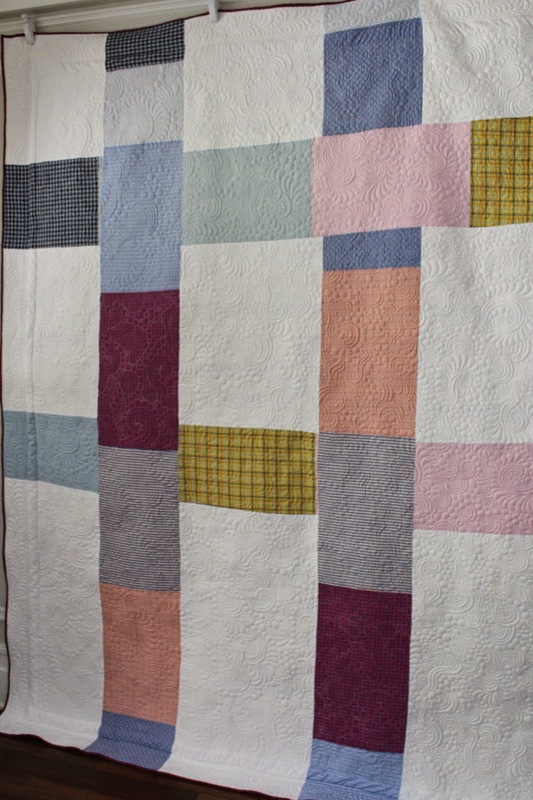 I used most of the rest of this blue cotton dress in the diagonals lines of the triple Irish Chain pattern. 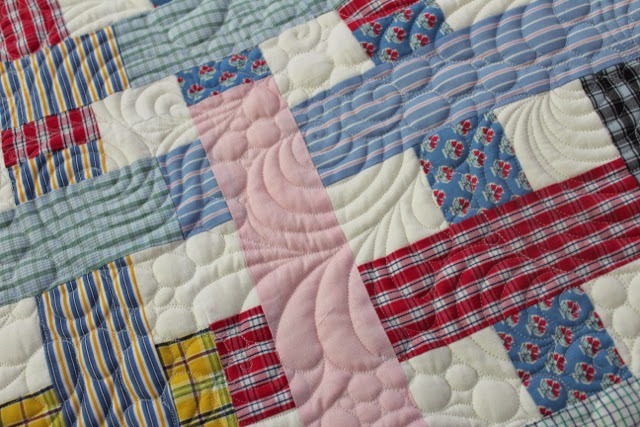 I added some matching blue flannel so that I had enough of the same color to complete the pattern. In the center of each chain is a flower …. … which is surrounded by tiny pebbles. Would you believe me if I told you each flower took me 1hr to complete? 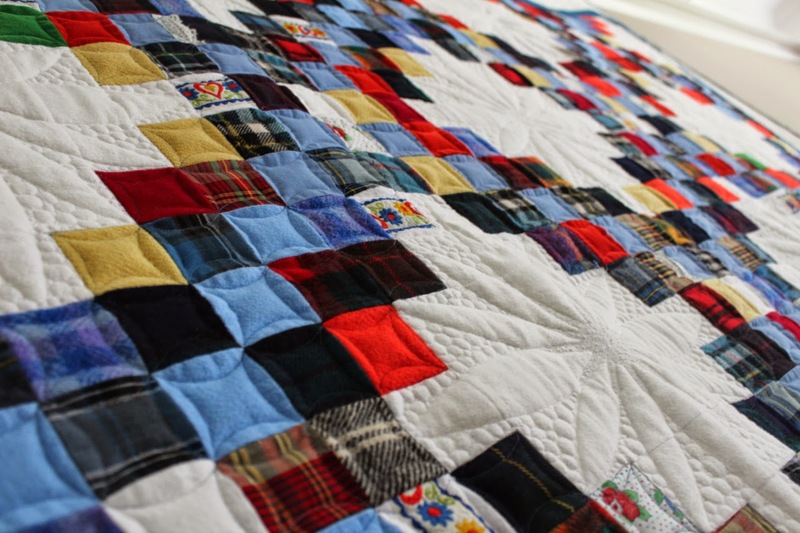 The border of the quilts is taken from the blue velvet in this dress …. 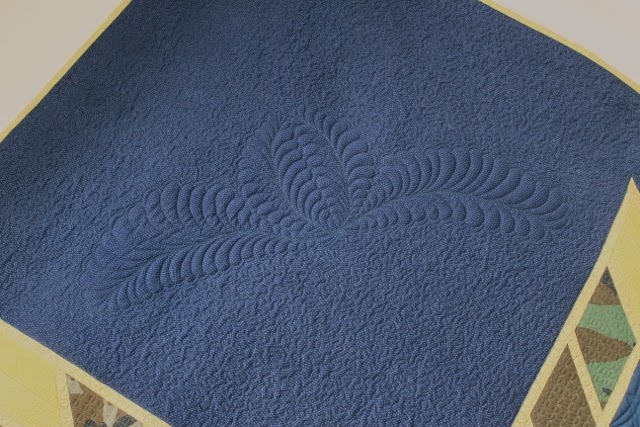 … I LOVE quilting velvet. It is gorgeous to work with. 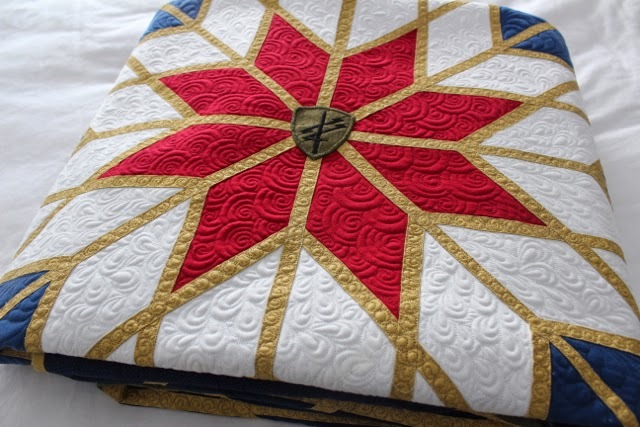 The binding is made from an old school uniform. 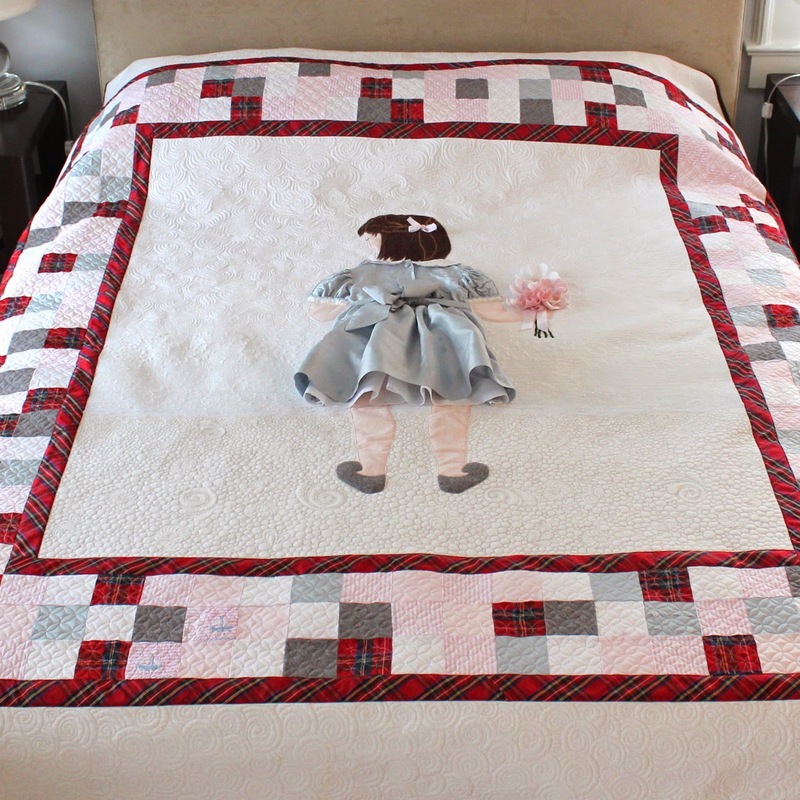 This is the first of four quilts I completed for the family. 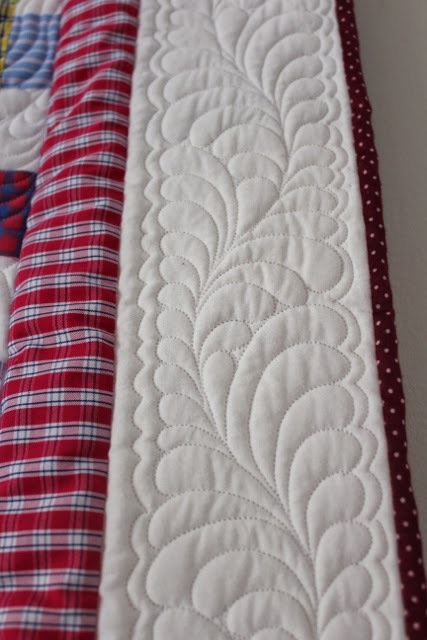 For me there are several really exciting moments in a project like this – being given the work is such a tremendous tremendous honor – the moment you load the finished top on the machine is so exciting – then finishing the quilting is even more exciting – and finally when you hand the materials back to the family as a finished quilt – that feeling is just something else.